Happy Friday We R fans! 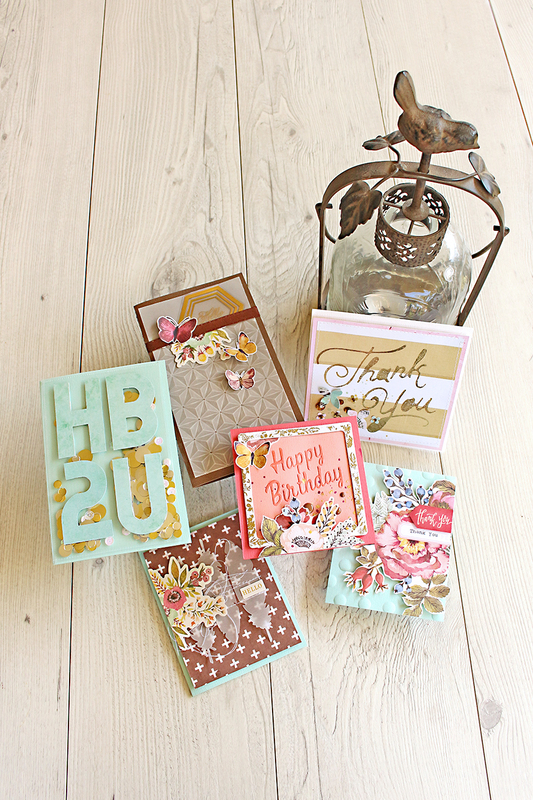 In honor of World Cardmaking Day tomorrow, we’re thrilled to welcome guest designer Melissa Phillips, cardmaking and stamping expert. Check out her beautiful projects below, and then scroll down to get to know a bit more about her. Hello everyone! 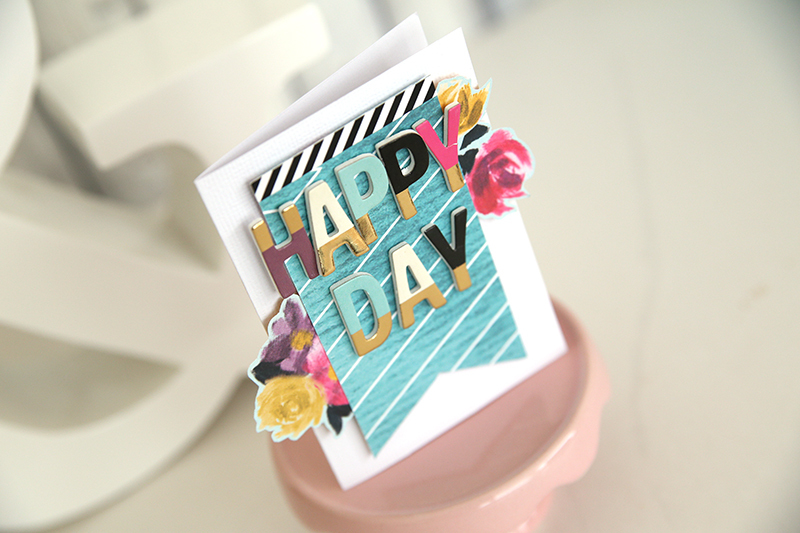 Melissa Phillips here, and I am so excited to get to celebrate World Cardmaking day with you. 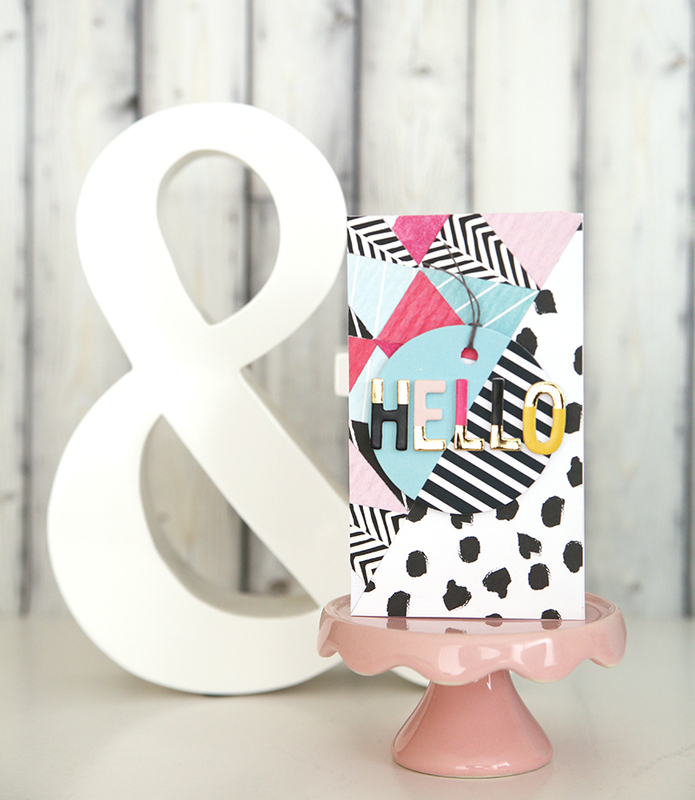 I was invited to create a couple of cards using the darling, new Urban Chic collection as well as the Frame Punch Board (what a fun tool!). 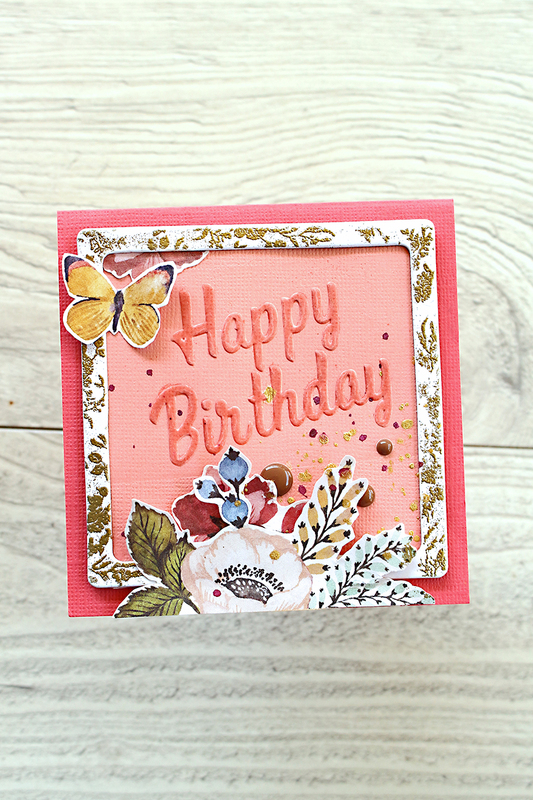 The frame for my first card was created using the Frame Punch Board. 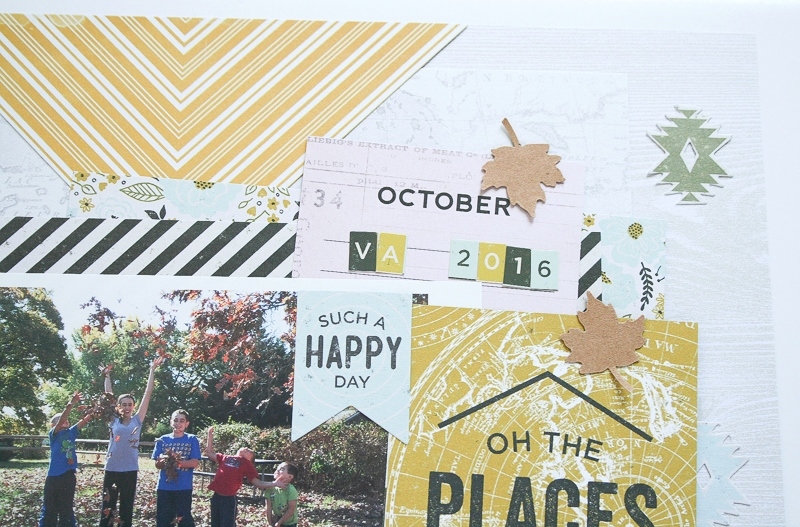 I selected patterned paper from the Urban Chic collection and in a matter of seconds had created a frame where I nestled my focal point. 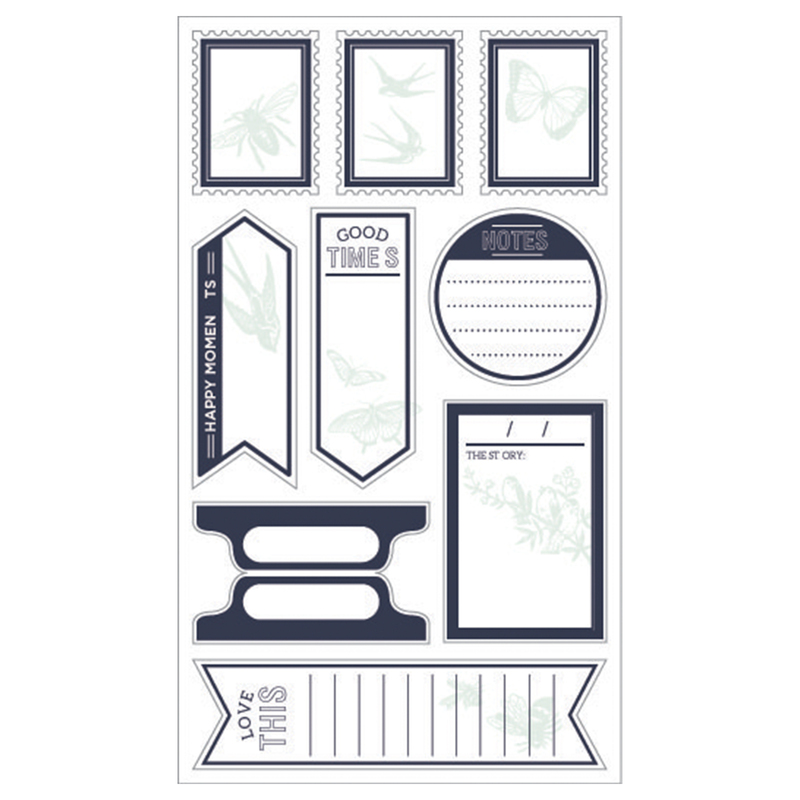 I added a few cardstock stickers such as the heart tab in the upper left corner and the tiny lips, and then stacked a few die cut shapes to finish. The Woodland Thickers are my favorite elements from this collection, so I used one of the symbols from the set to tie in with the current trends of today and to top off my tiny stack of die cuts. 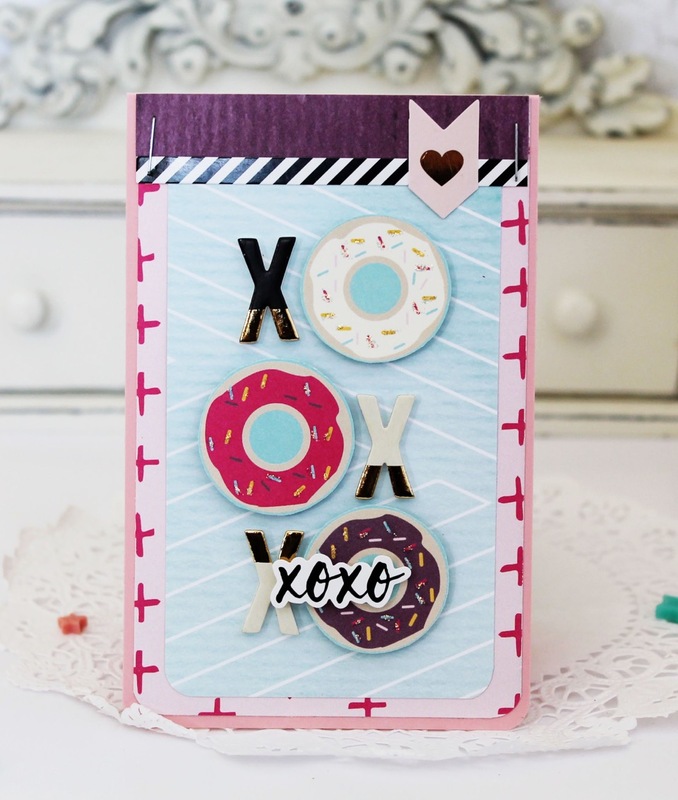 I had to use the sweet donuts from the Urban Chic collection somehow on my second card. 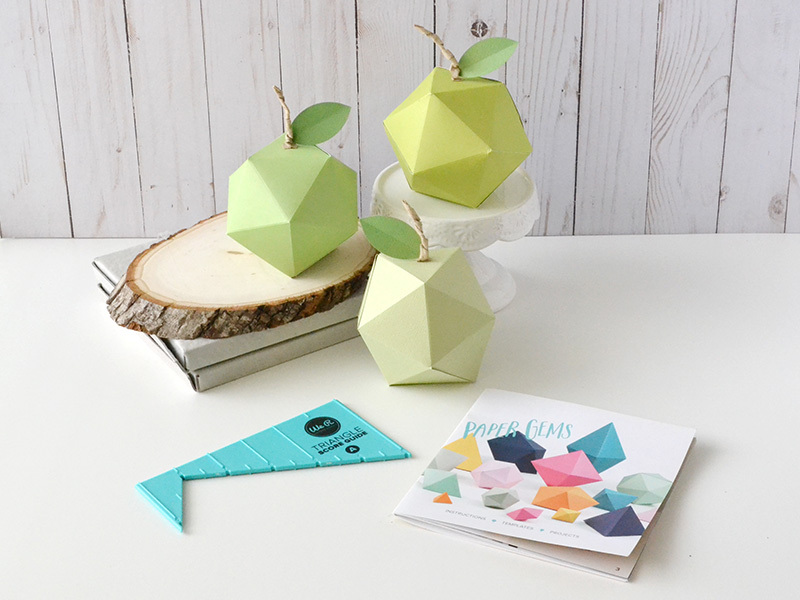 I love spotting these trendy little items popping up in the paper-crafting world. 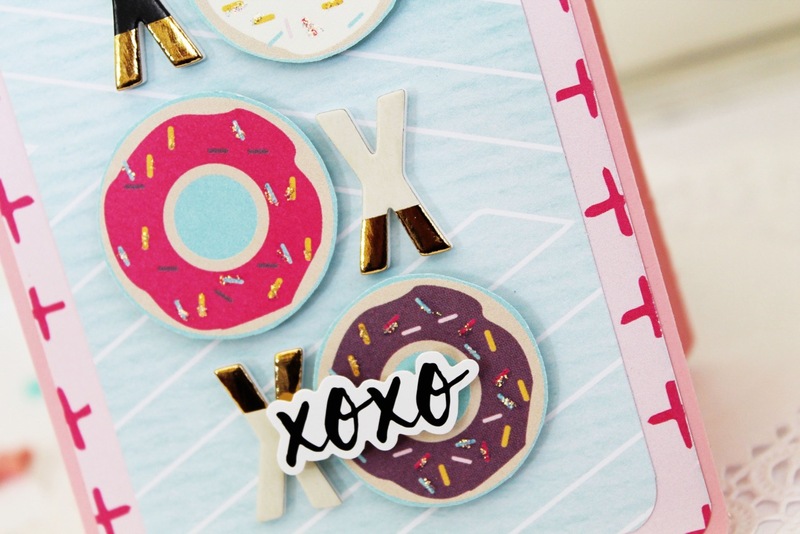 I simply hand-cut three donuts from the Street Vendor patterned paper sheet, added a bit of glitter to highlight the sprinkles, and then arranged them with Woodland Thickers to create my x’s and o’s. Stay true to your style and love what you create. Don’t feel like you have to create like everyone else in order for your style to be special, what matters is it’s uniquely you. What you create will be special to others and the joy you feel as you create, naturally comes through in what you create. Hello We R Fans! 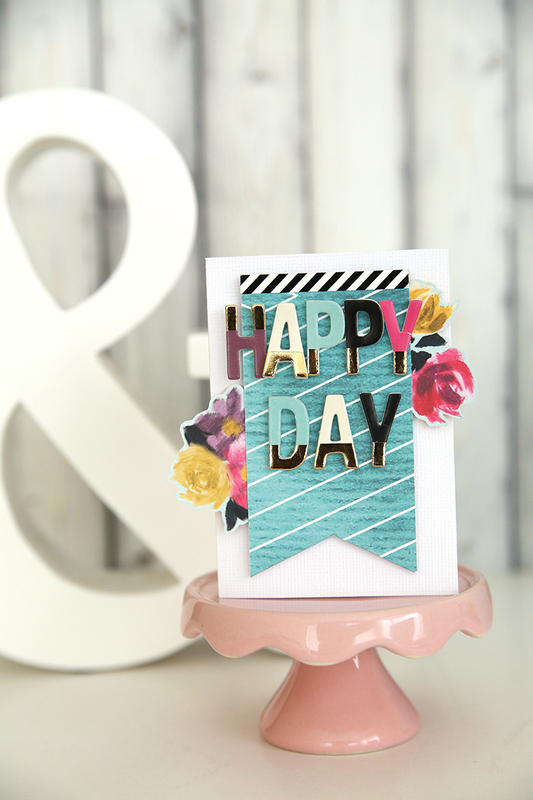 Kimberly here today with a card using the Fuse Tool from We R Memory Keepers, along with the products from the rest of the Fuse line. 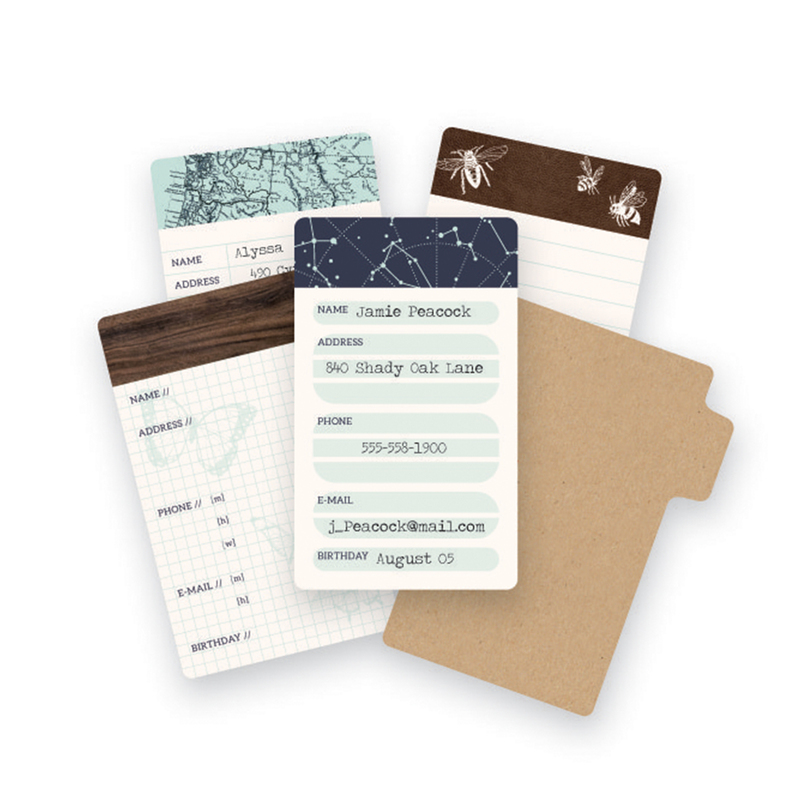 Shaker cards are so trendy right now and the Fuse makes it easy to create! 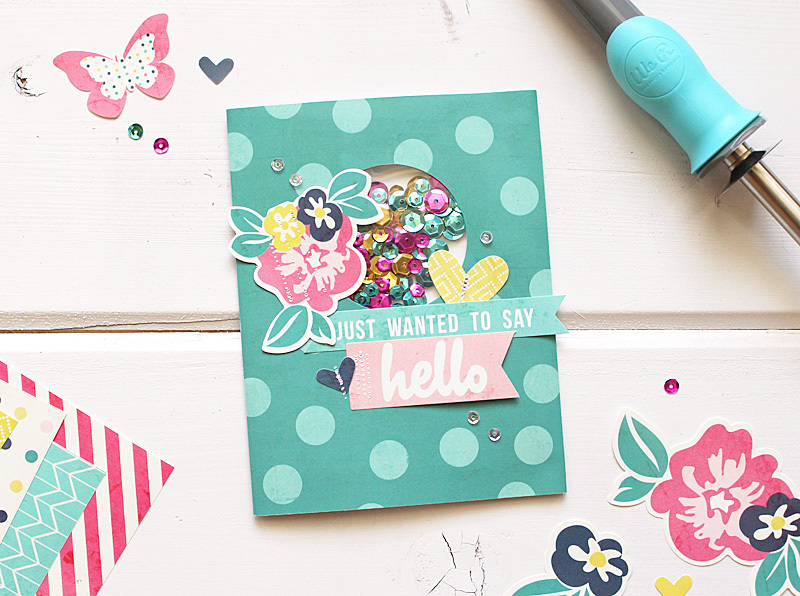 With a couple of simple steps, you will have a handmade card ready to send to a friend to brighten their day! 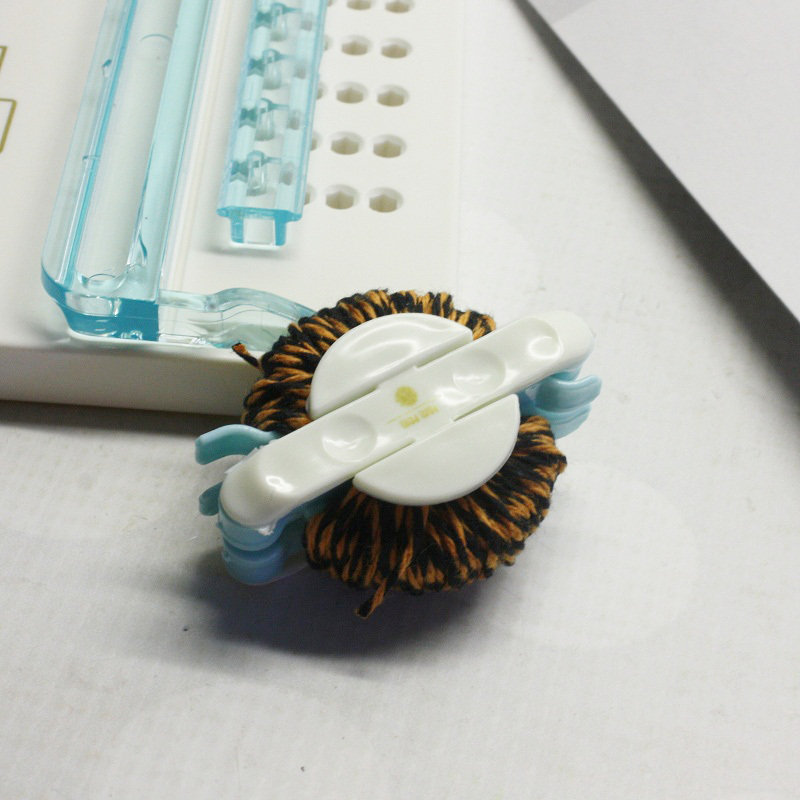 I started by heating up my Fuse Tool and placing the Fuse Mat onto my work surface. 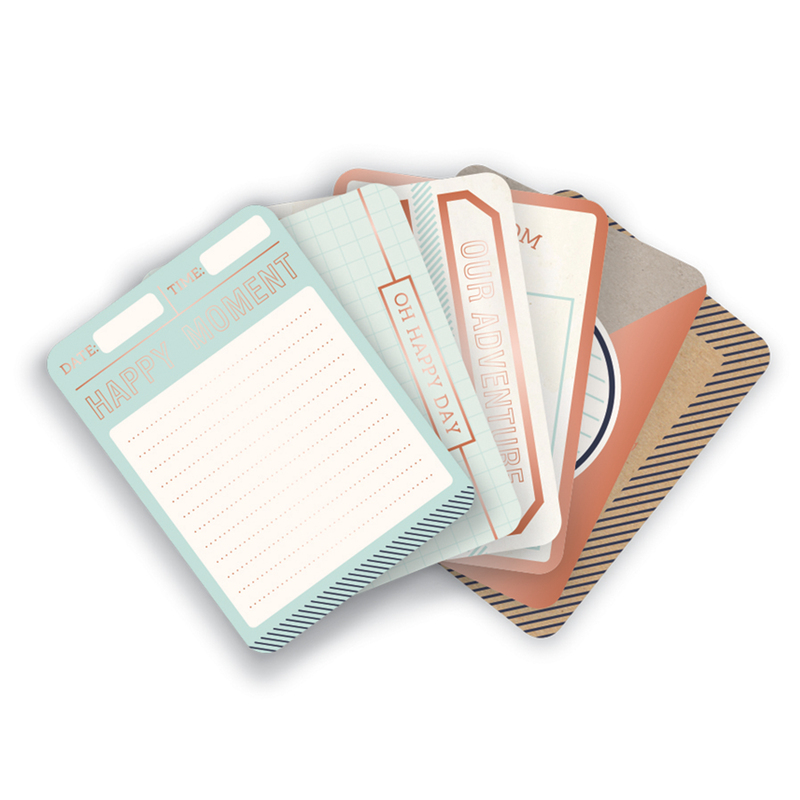 Then I grabbed the Everyday Fuse-ables Cards and Envelopes Kit. 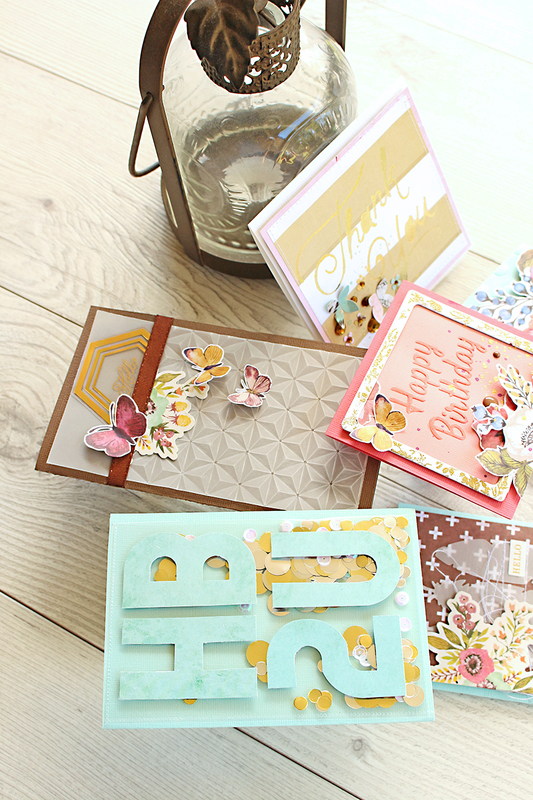 Inside the kit are pre- scored and pre-die cut cards, envelopes, sequins, plastic pockets, and embellishments. 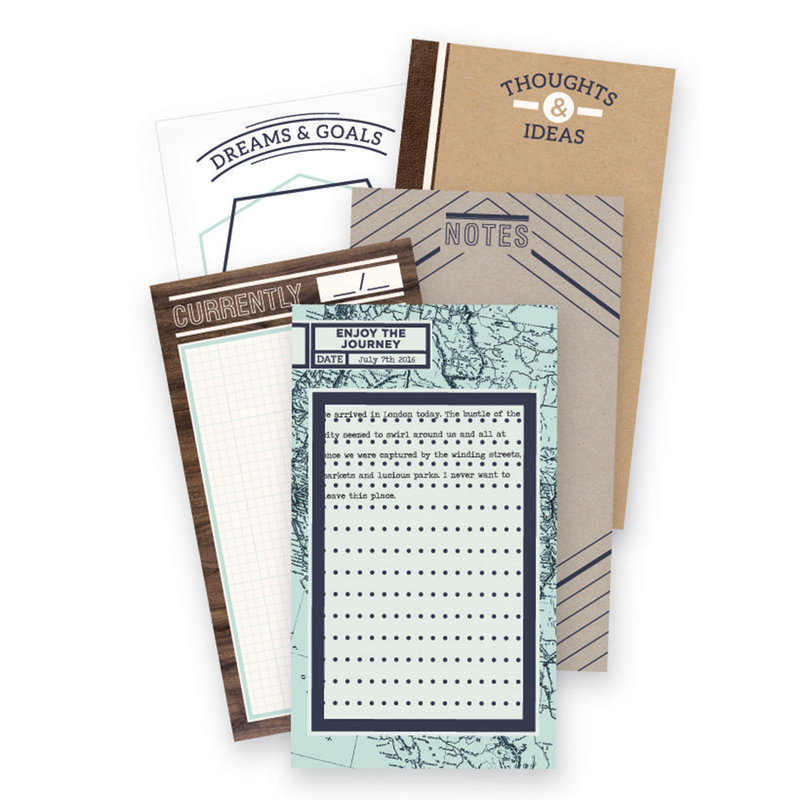 Everything you need to make several shaker cards. I filled one of the small, clear pockets with sequins. 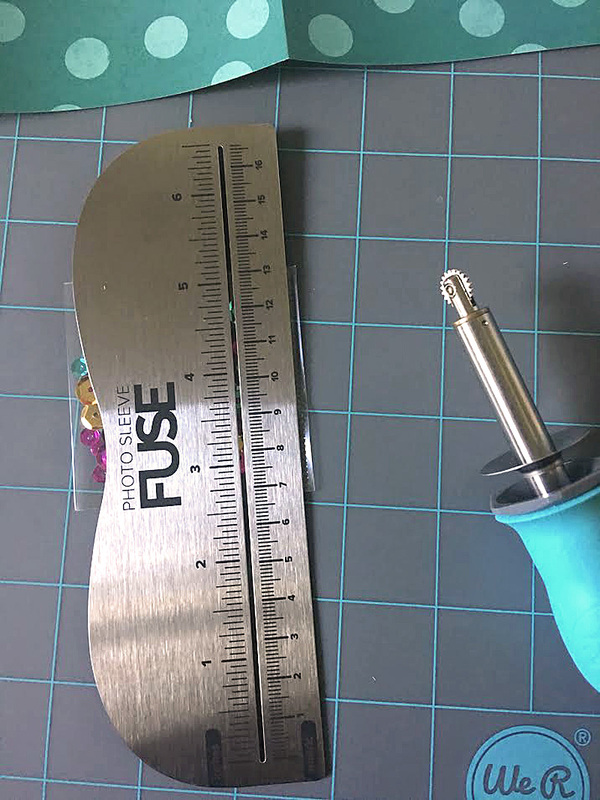 Then using the Fuse and the ruler, I slowly pulled the Fuse Tool tip along the edge of the ruler, with gentle pressure. After one pass along the ruler edge, the pocket is now sealed. How easy is that? The card base from the kit is a tri-fold card. 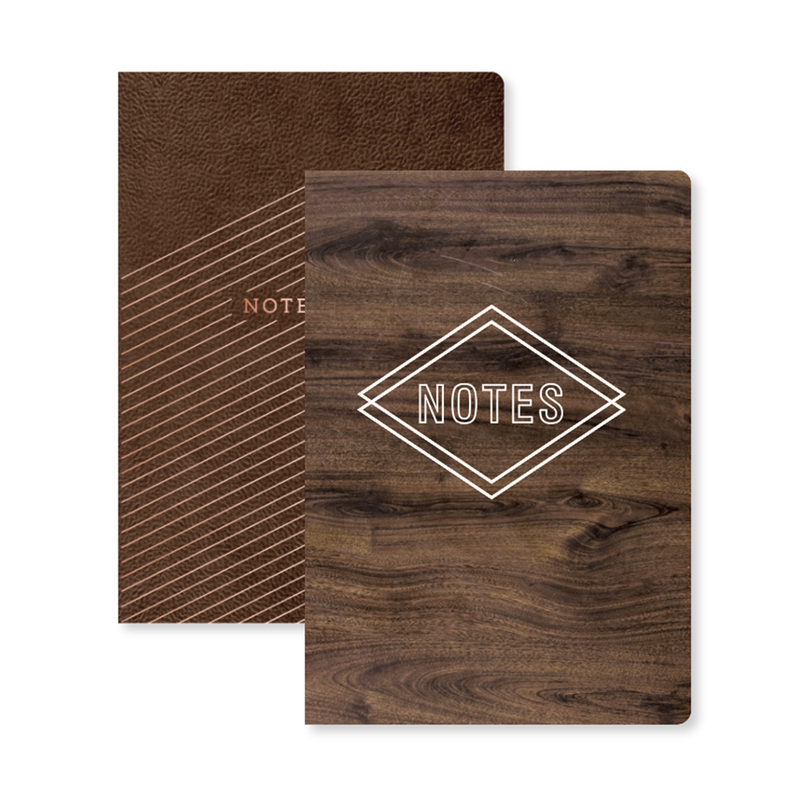 The genius part about this design is the fact that you can “hide” your shaker pocket inside the card. 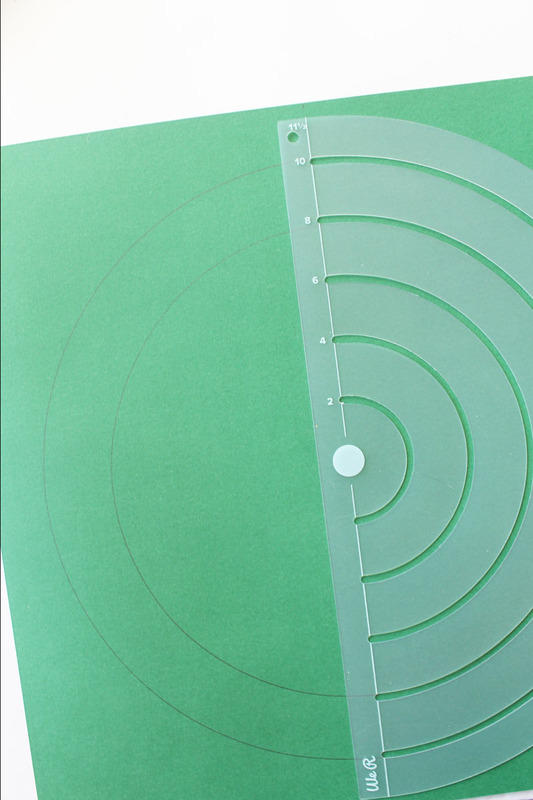 Using the Fuse Tool, I adhered the shaker pocket to the inside of the card, behind the die-cut circle. After enclosing the shaker pocket inside the card, I sealed the inside card edges closed by using the Fuse Tool around the edges. Not using the ruler this time, but going slowly free-hand. You can see the “stitched” lines I created on the inside of the card. A couple of Fuse embellishments from the kit where also added to the inside. They too “stick” to the Fuse card base with a simple pass over of the Fuse Tool tip. Once again, leaving those “stitched” lines behind. I love the look and texture they add! 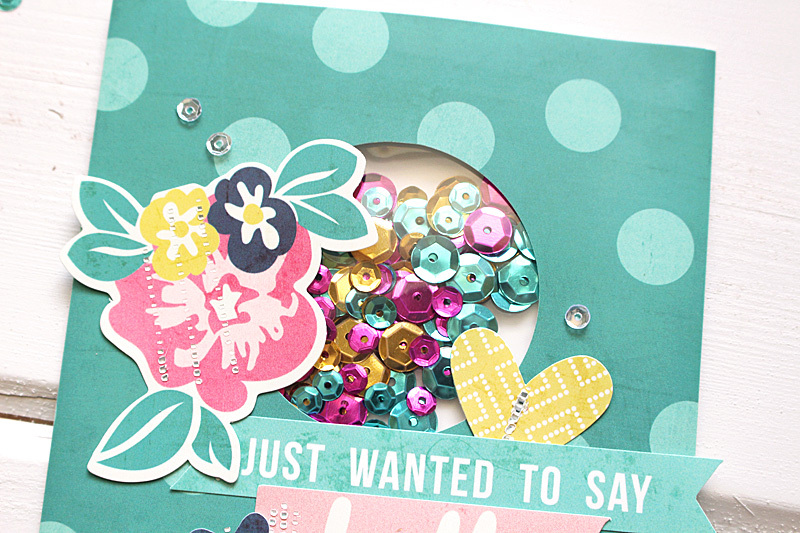 Once the inside of the card was complete, I added several Fuse embellishments to the front. Once again securing them with the Fuse Tool. 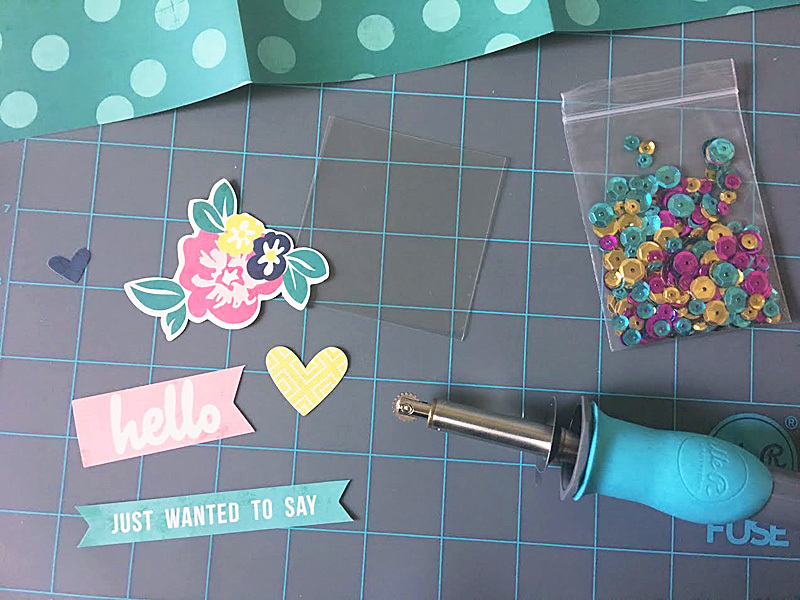 Not only is making a shaker card with the Fuse Tool a breeze, but adding the embellishments to complete the card is just as simple with the Fuse Tool. Who will you send a shaker card to? Hello again WeR fans! As Summer draws nearer for us in the southern hemisphere, so too do the birthday parties it seems! 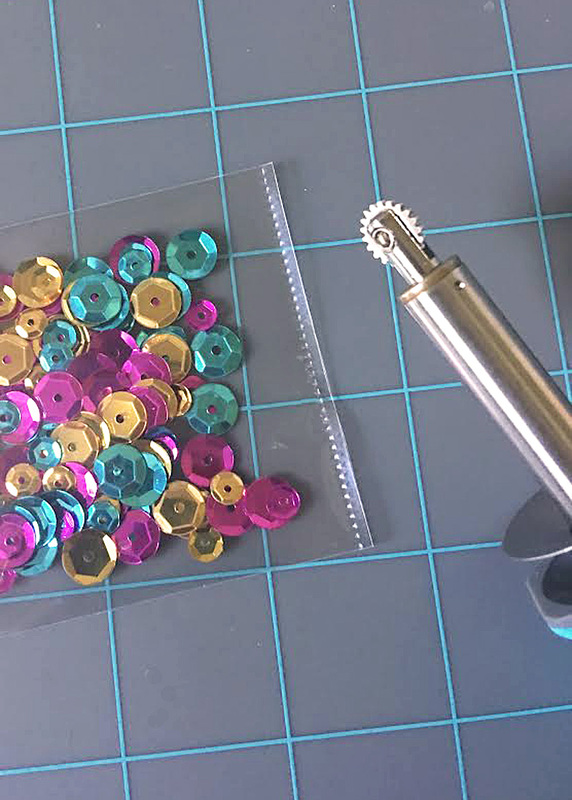 I’ve restocked my card supply using some pretty bits and pieces and a couple of tools, which you might already have in your stash. 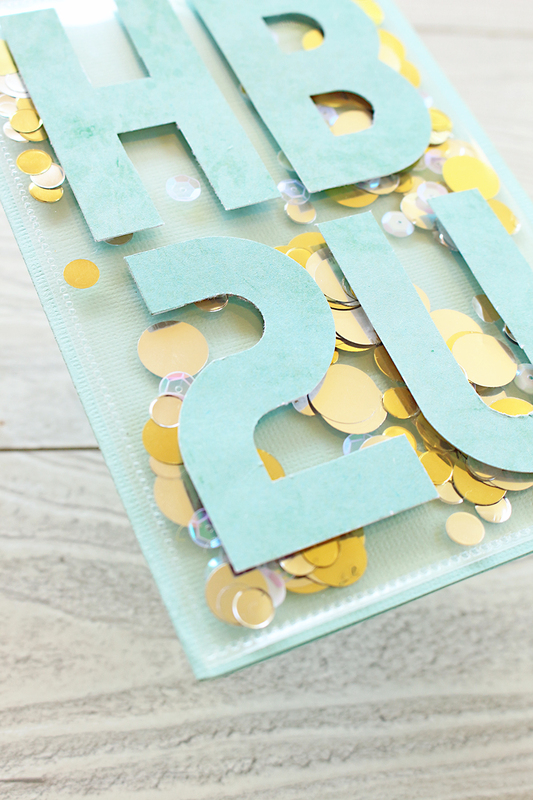 Most of these cards use coloured card from a 12×12 DIY Party cardstock pad. This one has a gorgeous aqua base and over the top I’ve popped a bit of some Indian Summer, which I have been hoarding for a while! 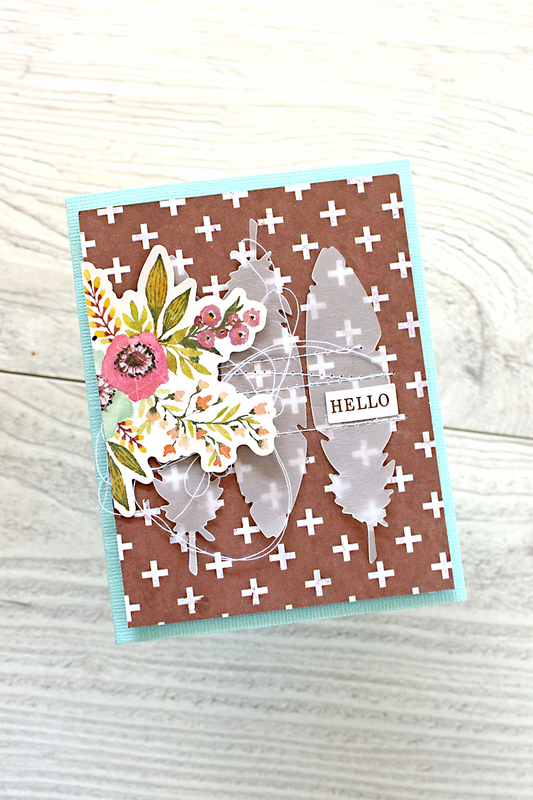 I’ve cut some feather shapes using my Evolution Advanced with a WRMK metal feather die. 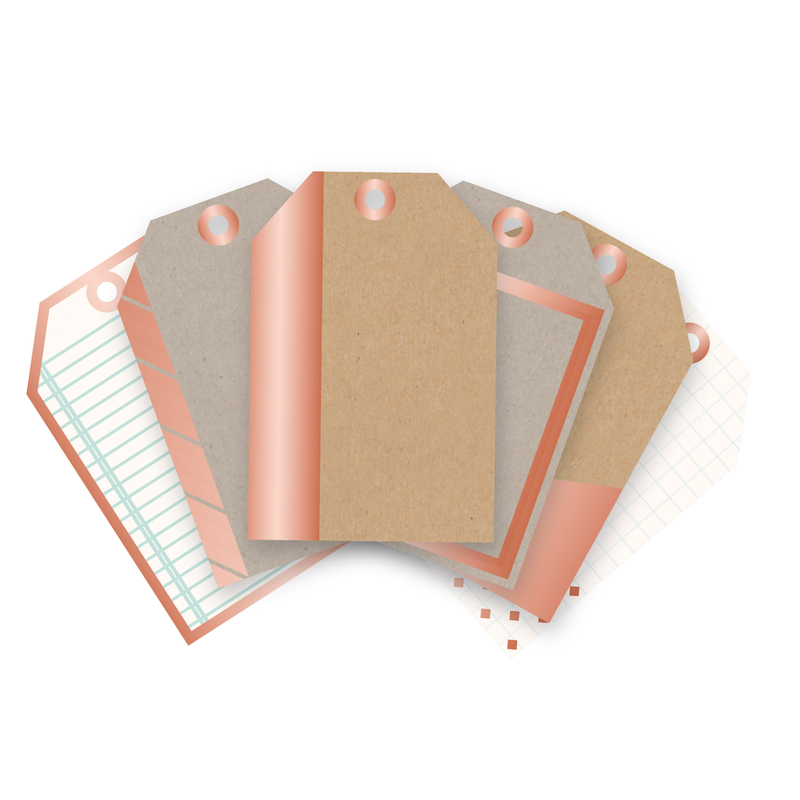 Other embellishments are some Wildflower cardstock stickers. 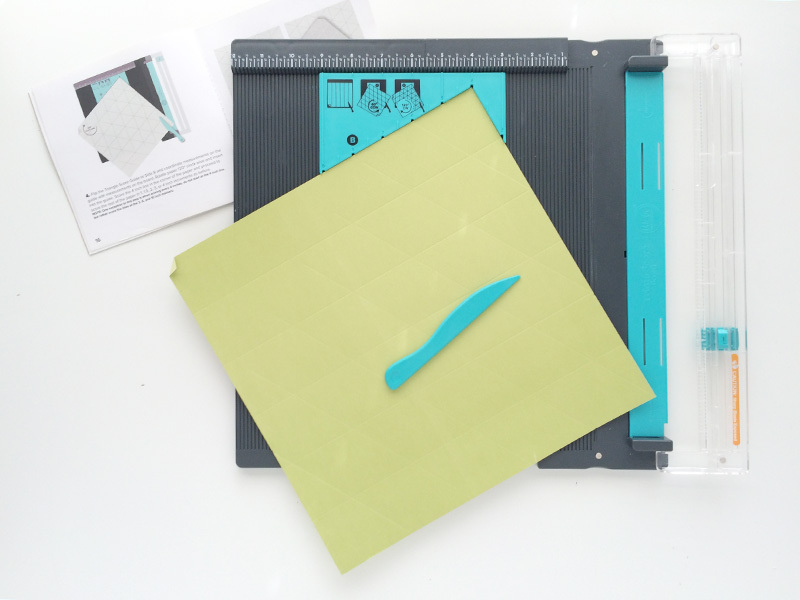 TIP: Get more from larger sticker shapes by cutting them in half to use on another project. This one has some embossed vellum and ribbon detail. I’ve placed the embossing folder a little way down the vellum sheet to create a bit of contrast in the textures. 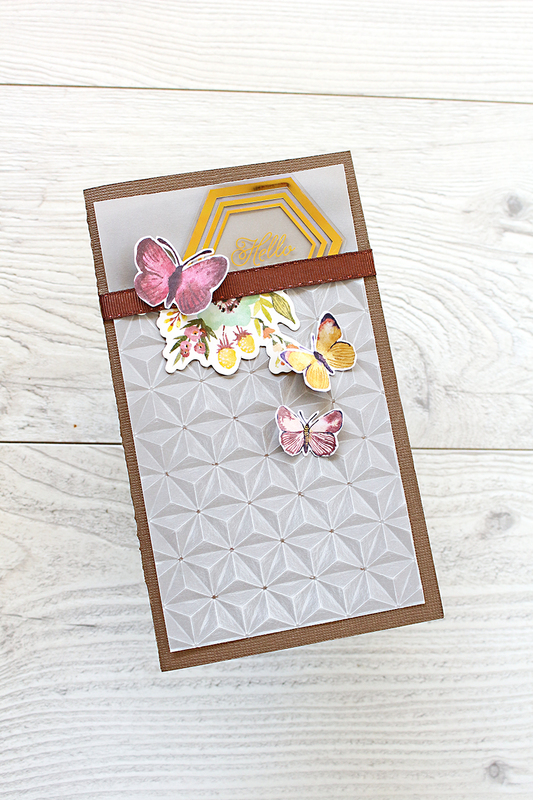 It’s finished off with some hand cut butterflies from a sheet of Wildflower ‘Butterfly Garden’ and a Clearly Posh die cut shape for the title. 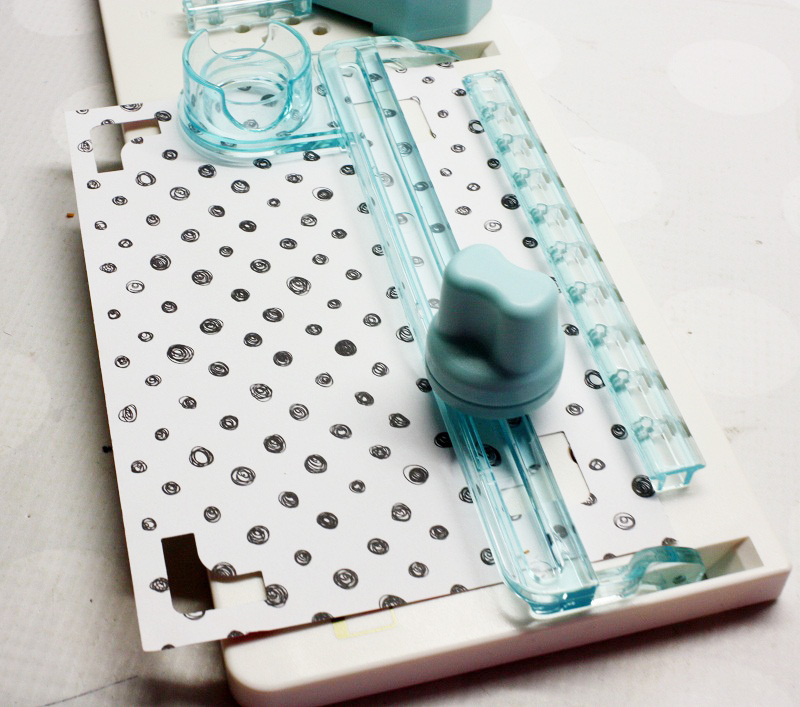 TIP: I’ve applied my adhesive in tiny dots under the embossed pattern in the vellum so that it’s too visible. This shaker card uses a 4×6 waterfall sleeve and some DIY Party confetti which have been sealed with my Fuse Tool. I’ve popped some lettering on the top for my title which I created using my Mini Alphabet Punch Board. 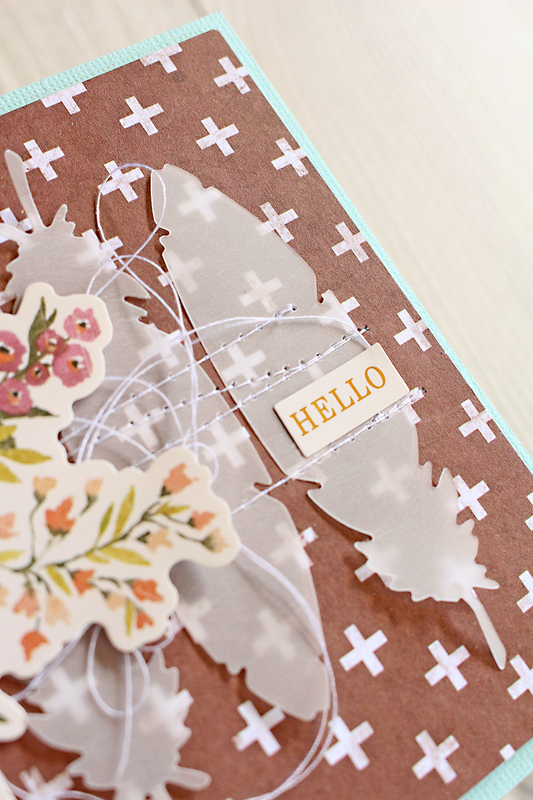 Card number four is a breeze to put together: some embossed cardstock, a hand cut bloom and a simple phrase. 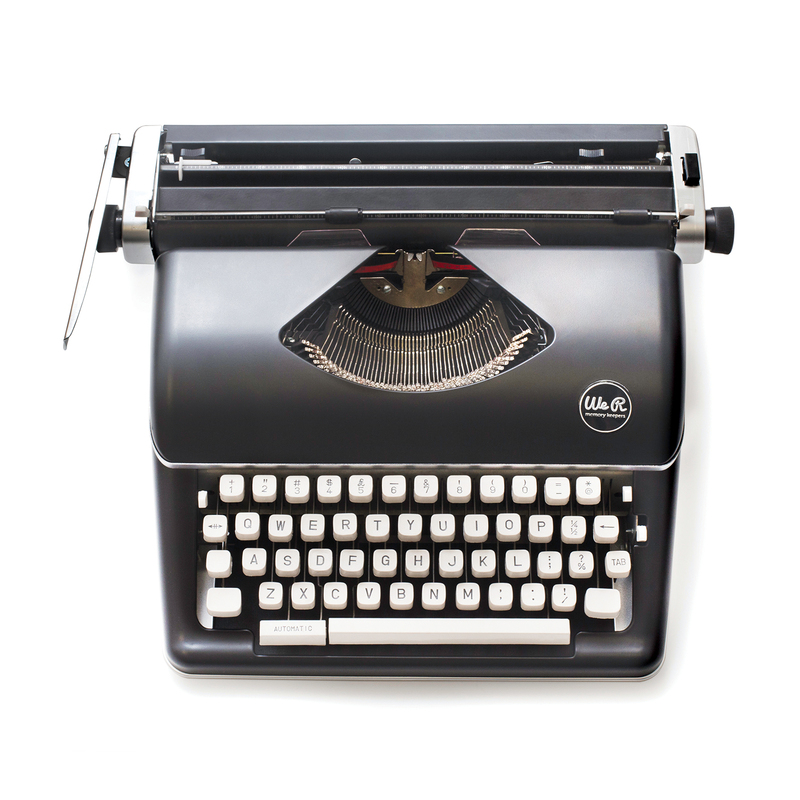 Create your own if you have a typewriter! I’ve gone over areas with a glitter brush pen for a bit of sparkle. 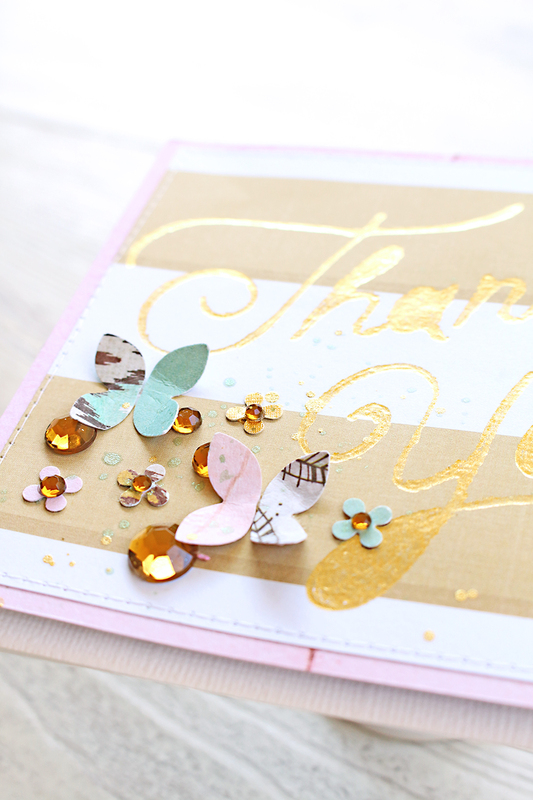 This thank you card has some simple paper layering using Love Notes ‘Valentine’ and Crush ‘Love Defined’. I’ve added some foil detail with my Heatwave tool and a stencil. 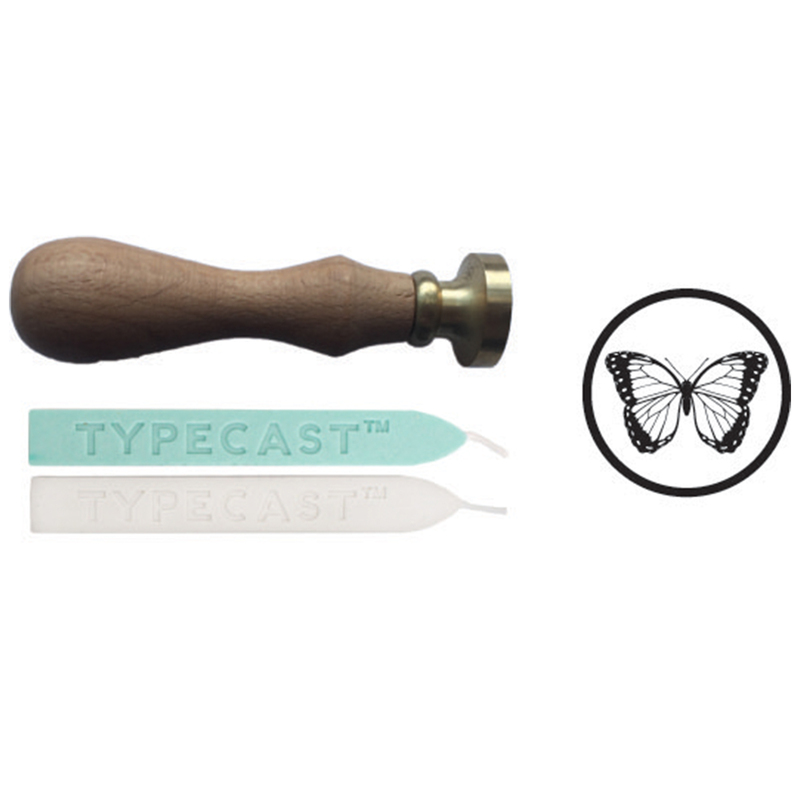 Tiny floral detail comes in the form of some new font punches. Click here for a quick look at this fun tool in action. 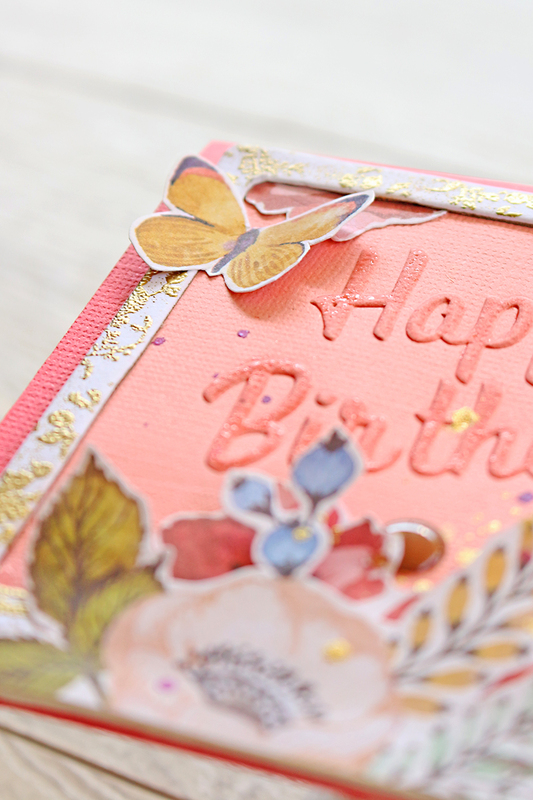 Finally, this card makes use of some dry and heat embossing. 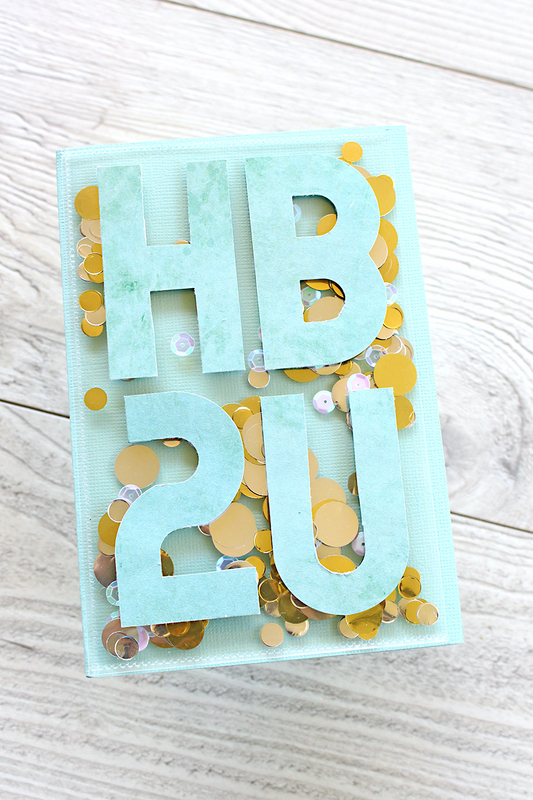 The title uses a ‘Happy Birthday’ Classic Phrase embossing strip, which has been run through my Evolution Advanced. 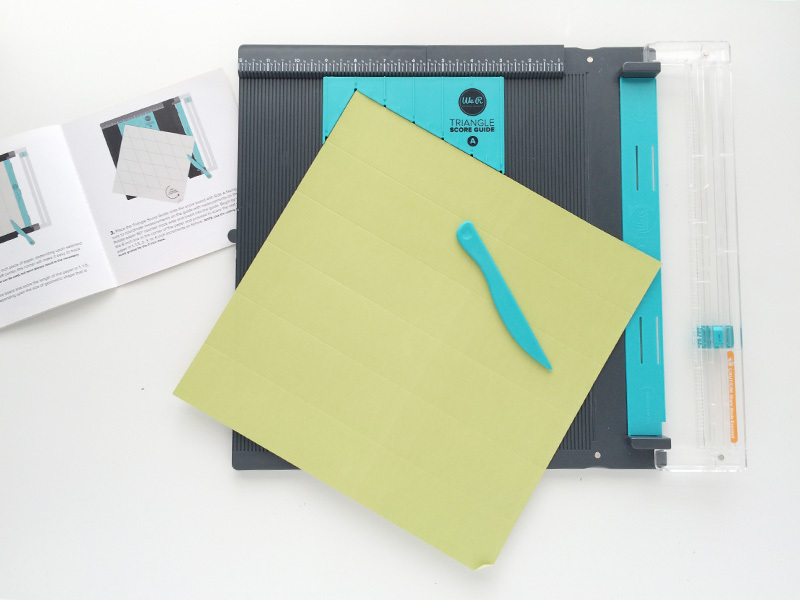 These little embossing strips are fabulous for cards and come with guides printed on the folder so you know your pattern is going to be perfectly aligned. I then clear heat embossed the wording so it would stand out a bit more. TIP: I used a Versamark pen to ensure the coverage was accurate. The white Ruler Studio frame I used on the card has been stamped with Versamark ink and heat embossed with gold embossing powder. I really like the way this turned out. It gives it a vintage twist, which coordinates so well with those beautiful Wildflower illustrations. 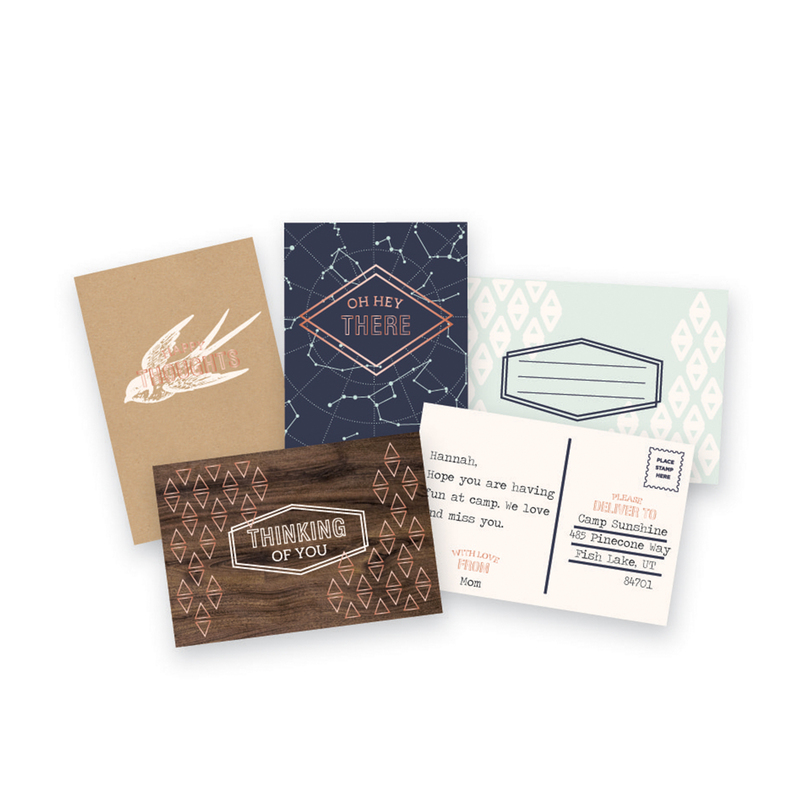 Really make an impact by pairing your cards with custom Envelope Punch Board envelopes too! Thanks so much for joining me today. 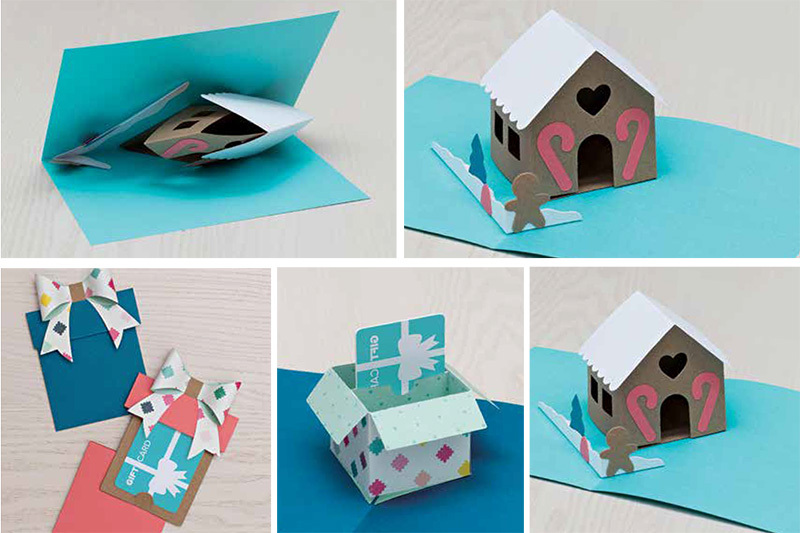 Happy card making! Hello everyone! 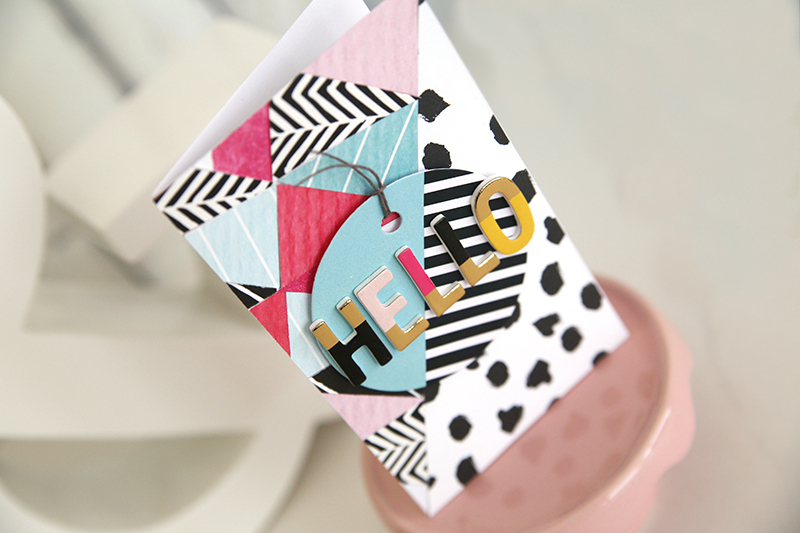 Eva Pizarro here today on the blog showing you some cards made with the Banner Punch Board. 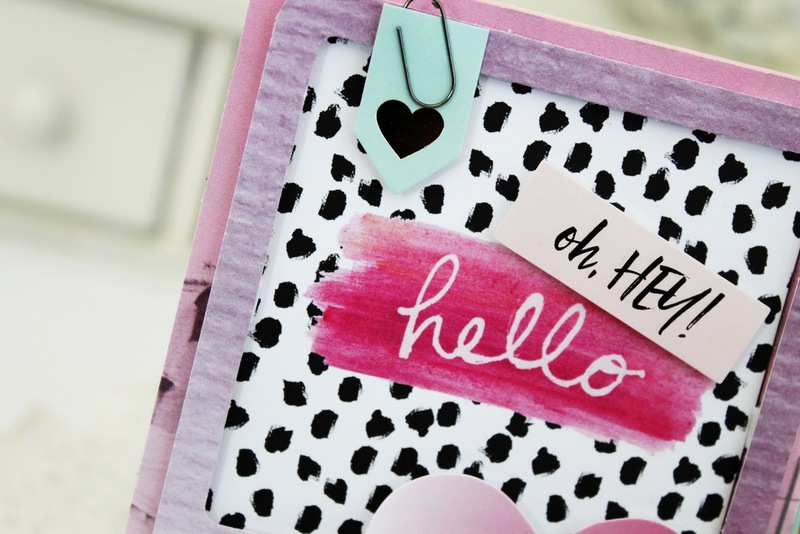 This board is one of my favorites and I use it all the time, not only to make banners but also on layouts and cards! 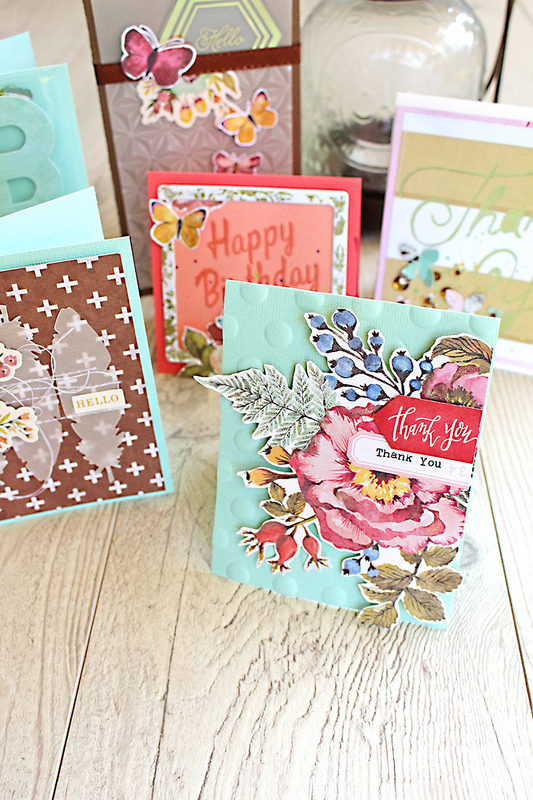 For these cards I am using the lovely Urban Chic collection. I love the girly feeling and the bright colors mixed with black and gold accents. To make one of the cards use your Banner Punch Board to cut a small flag. 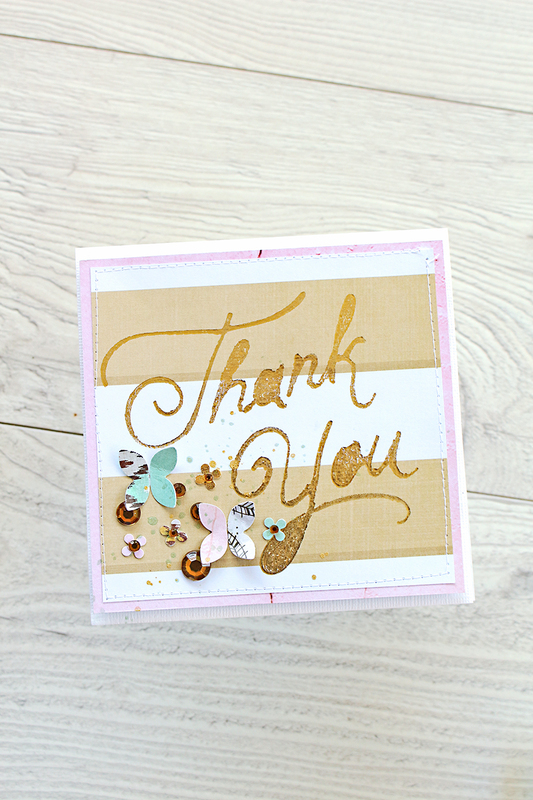 Adhere it to your card and add a sentiment with the gorgeous alphas from this collection. 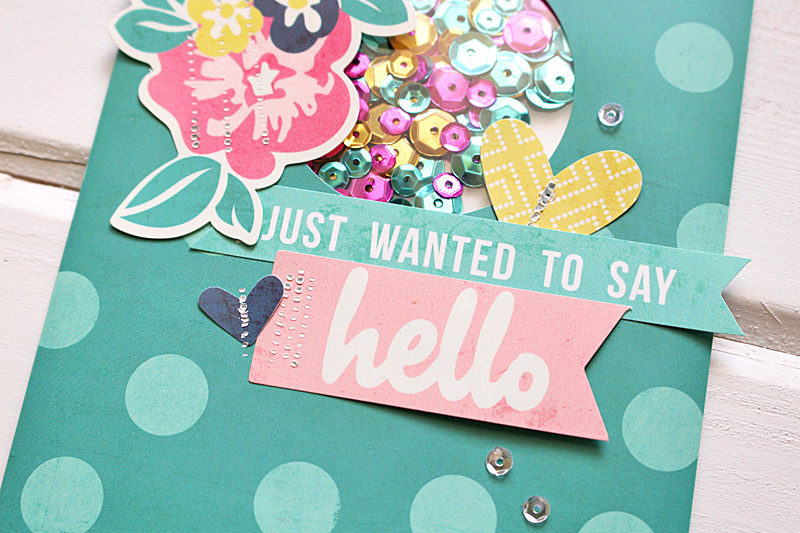 I also embellished my card with some cut out flowers and a small cardstock sticker. 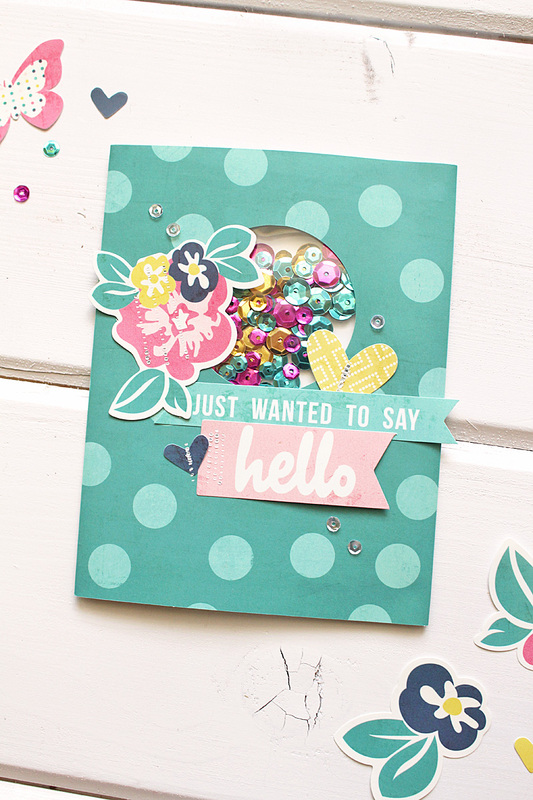 To add some dimension adhere your banner to your card base using 3d dots. 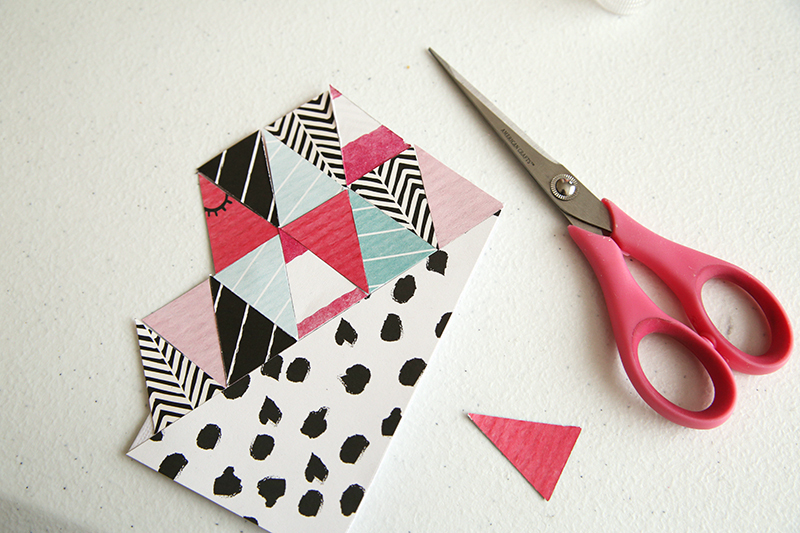 To make the other card cut small triangles 1,5 inch tall in different patterned papers. 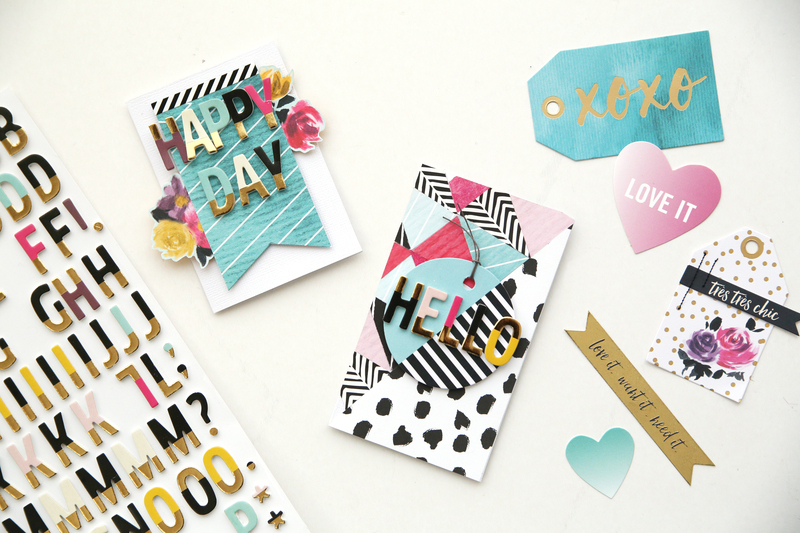 Cover only half of your card base with the patterned paper triangles. 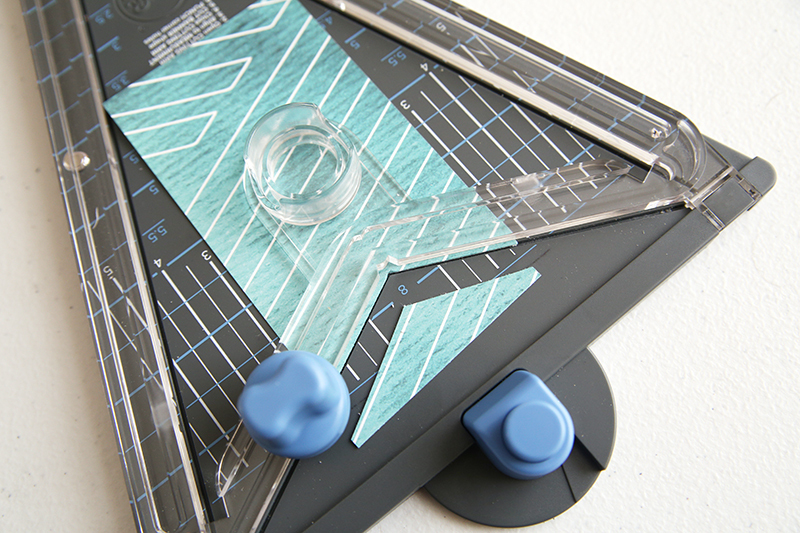 Place a tag on top of your triangles and again use your alphas to write your sentiment. Finish your card with some hemp twine. For my title, I selected some of my alphas with the gold accent on the bottom and some alphas with the gold on the top. 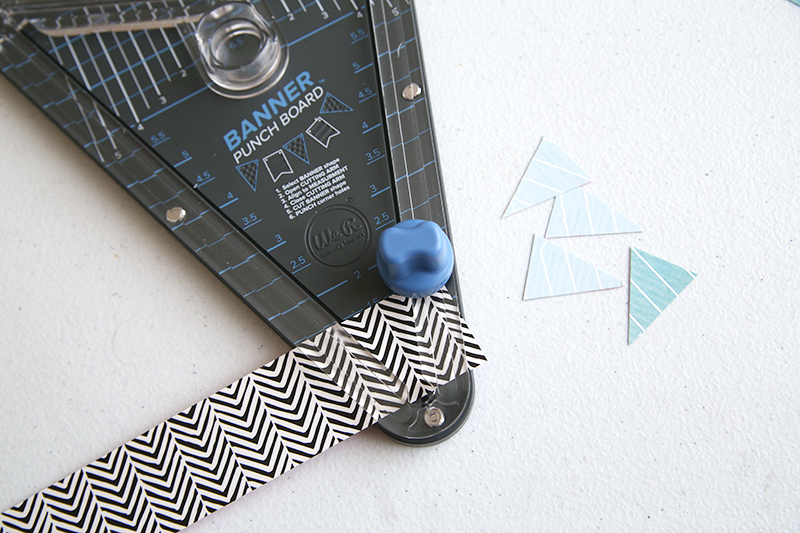 Do you have a Banner Punch Board? Do you use it for something other than banners? If you do share the link! I would love to see it! 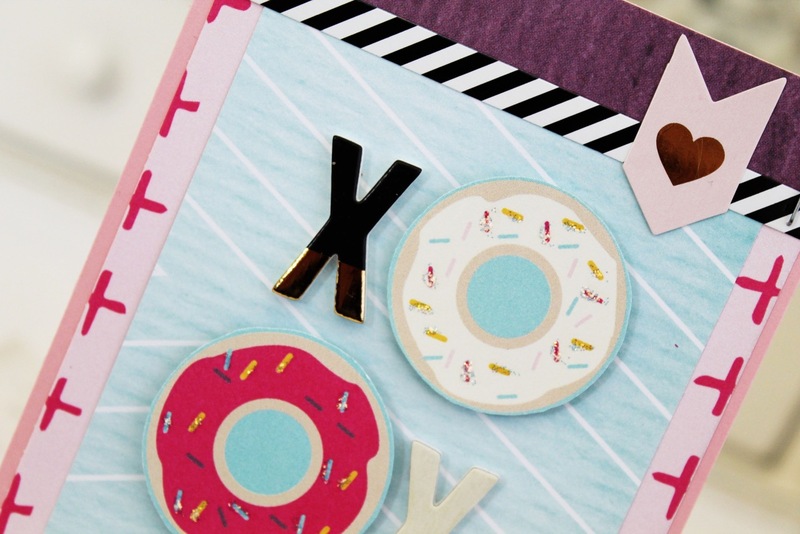 This Saturday the craft industry is celebrating World Cardmaking Day, so this week on the blog we’ll be featuring handmade cards from our design team. 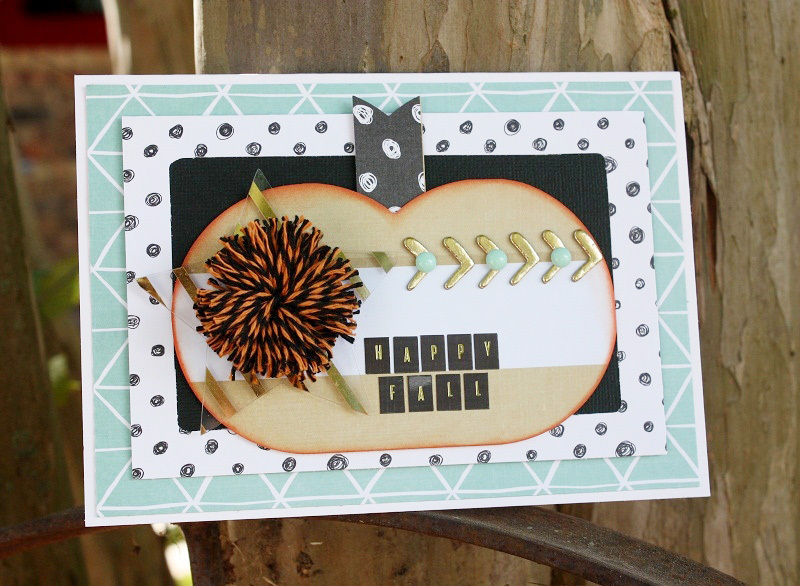 First up is Shellye with a cute and clever fall card she made using the…wait for it…Crush Valentine’s Day collection. What? Check it out below! Hello, We R fans! 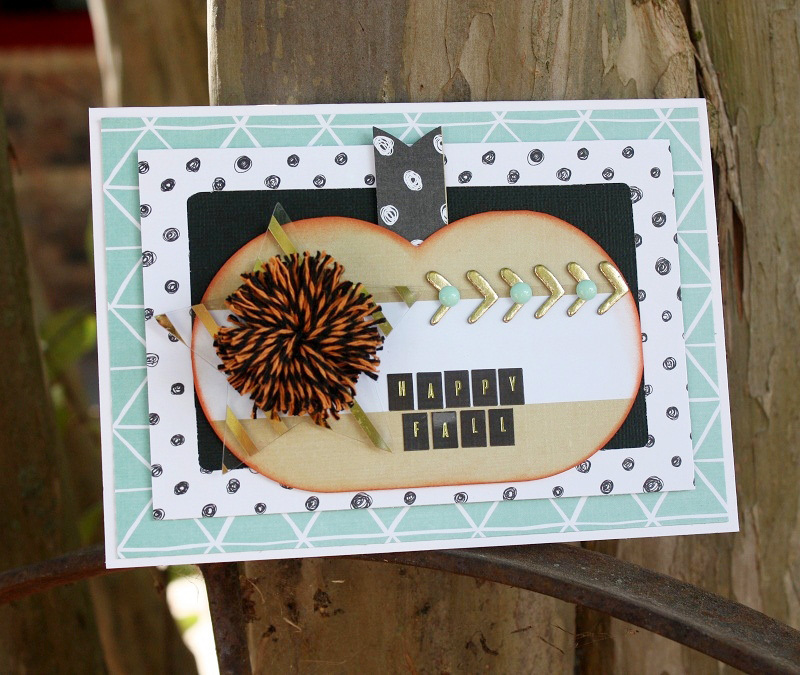 Shellye here with a “Happy Fall” card made with leftovers from the Crush Valentine Collection! I started by making the pumpkin from a 3X5 piece of the “Love Defined” paper. I used the Alphabet Punch Board and rounded the edges as you would in making the “O”. Next I punched the decorative “v” shape into one side. I used a dark orange chalk ink to add some shading around the edge of the pumpkin. I love the new Frame Punch Board, so I used it to make a 4X6 frame from the “XOXO” Paper. The opening was filled with a plain piece of black cardstock. 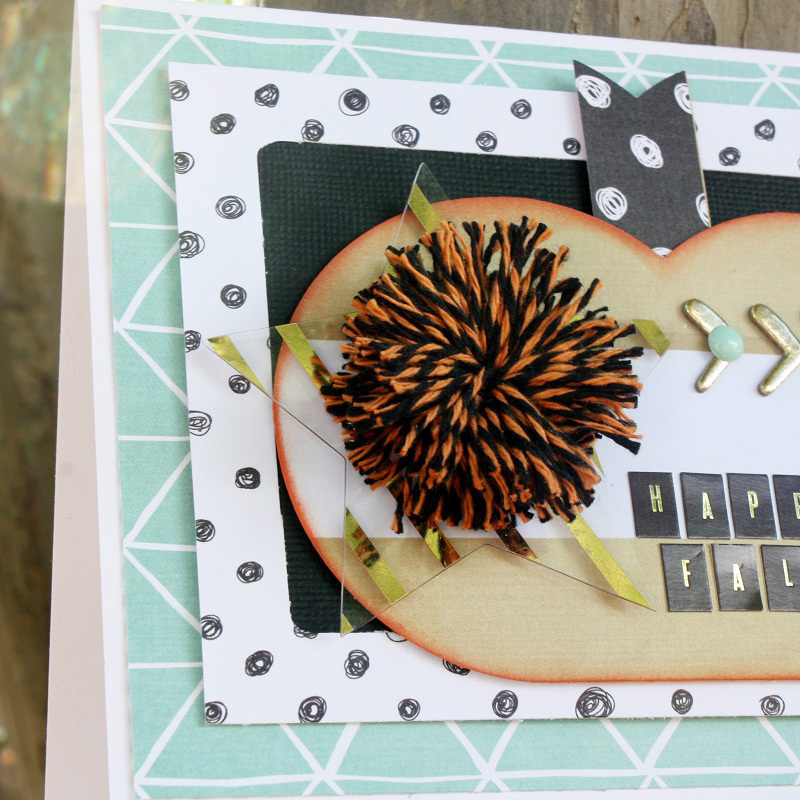 The pumpkin was added to the center of the frame with foam adhesive and then embellished with an acetate star from the Crush Ephemera Pack and the pom pom. To mimic the decoration on the inspiration photo, I used the gold comma stickers from the Crush Thickers and then topped a few with aqua enamel dots from my stash. “Happy Fall” was spelled out using the letter stickers found on the Crush Sticker Assortment Sheet. 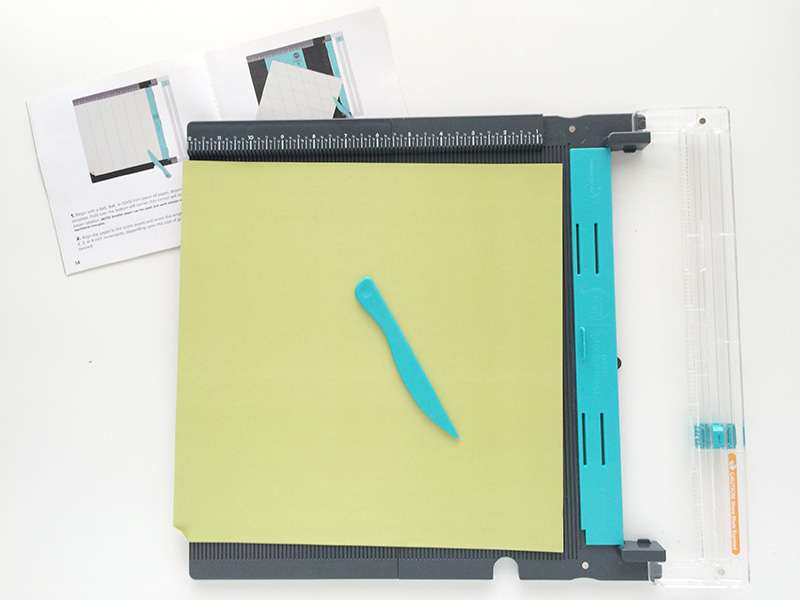 To carry out the aqua color, the “Hypnotized” paper was used as a mat and then mounted onto the 5X7 card front. Happy Friday friends! We’re kicking off the weekend with some exciting news! 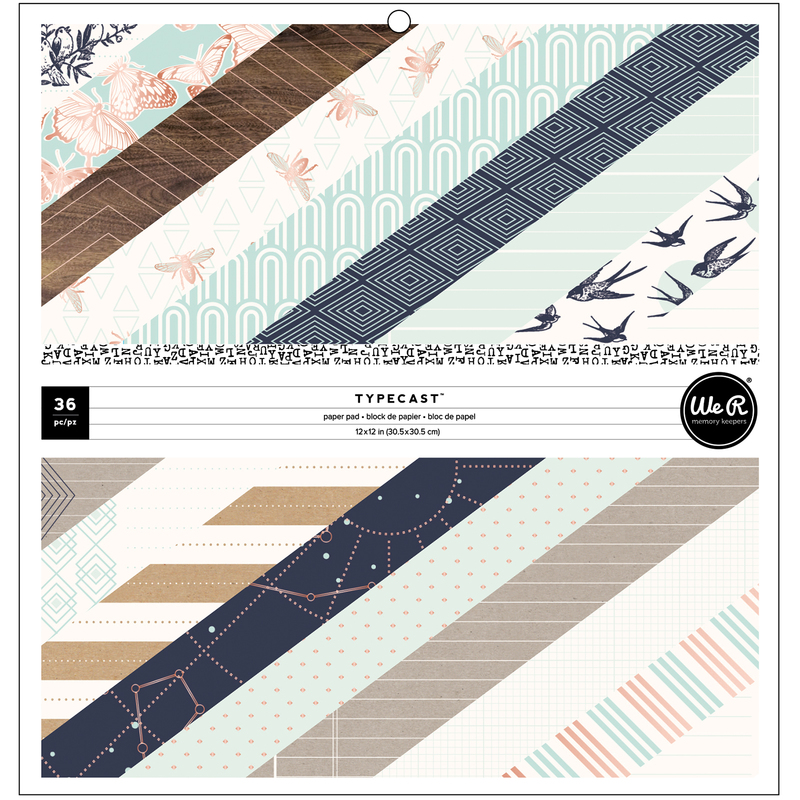 We’ve got three new releases to share with you today. Let’s get right to it, shall we? We’re thrilled to introduce you to our Ribbon Cutter! 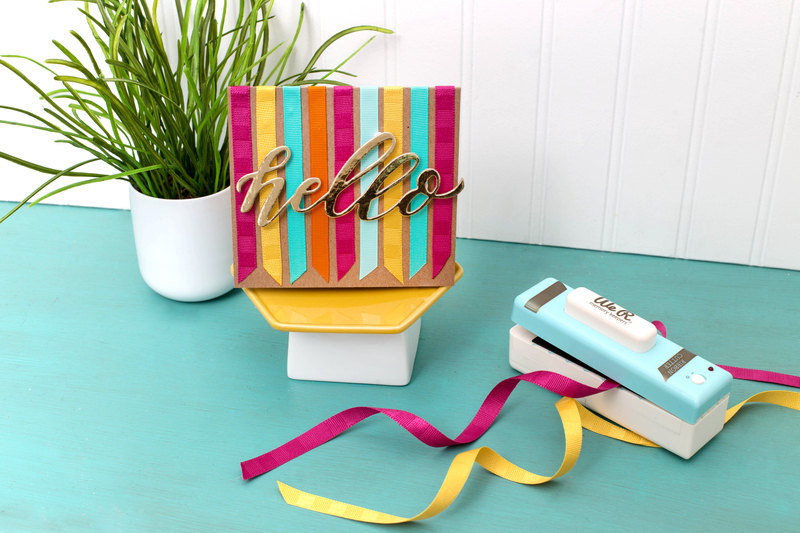 This craft room staple cuts and heat seals ribbon up to 3″ wide so there is no fraying. 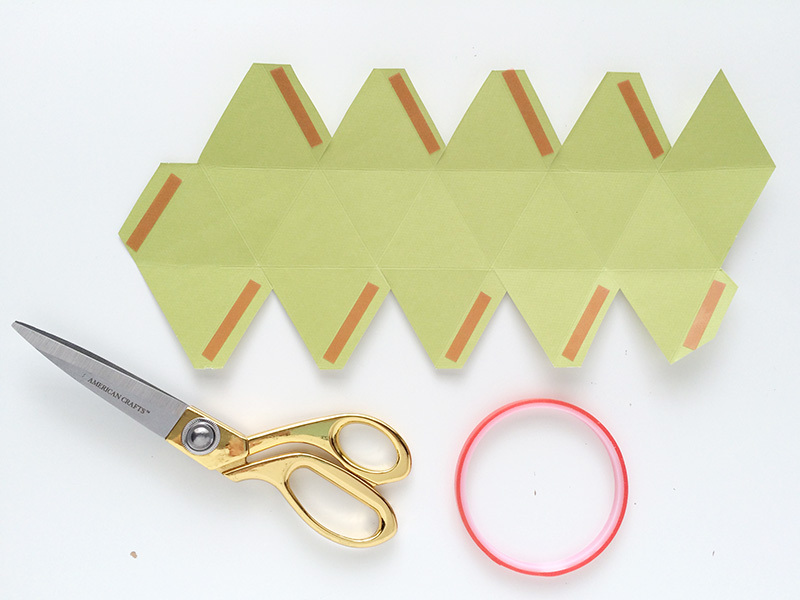 Cut straight, angled, and even various styles of points into the ends of your ribbon. 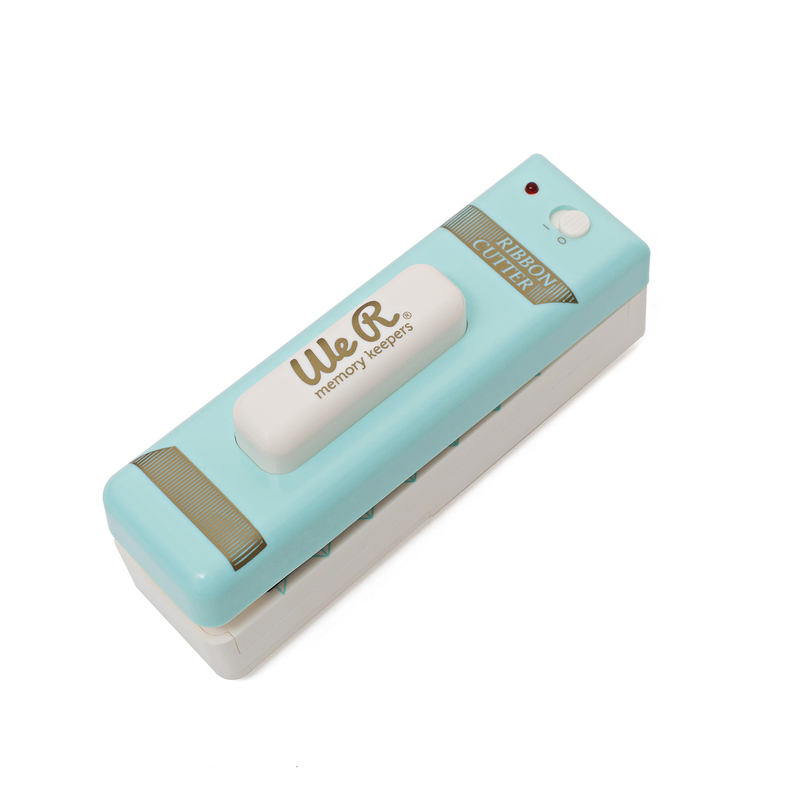 The Ribbon Cutter requires four AA batteries (not included). Replacement wires are also available. 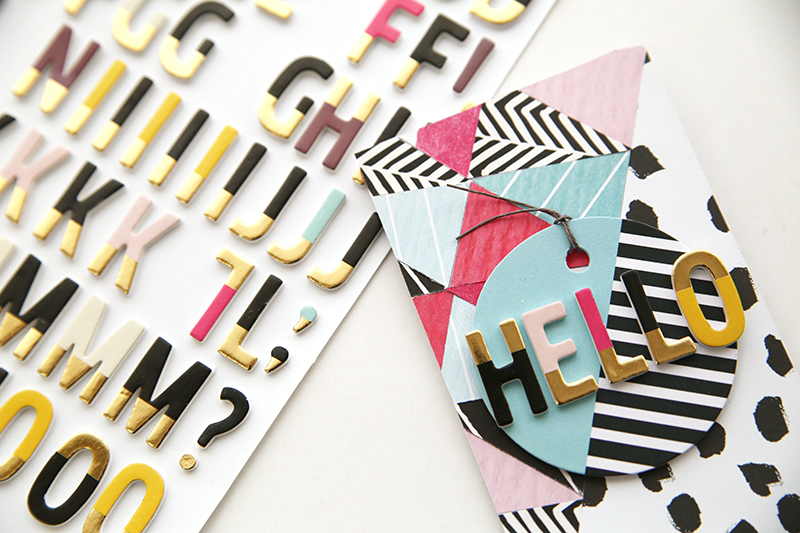 We’ve got some brand new designs to add to our popular Pop Up Dies collection. Check out what you can make with your Evolution Advanced below. 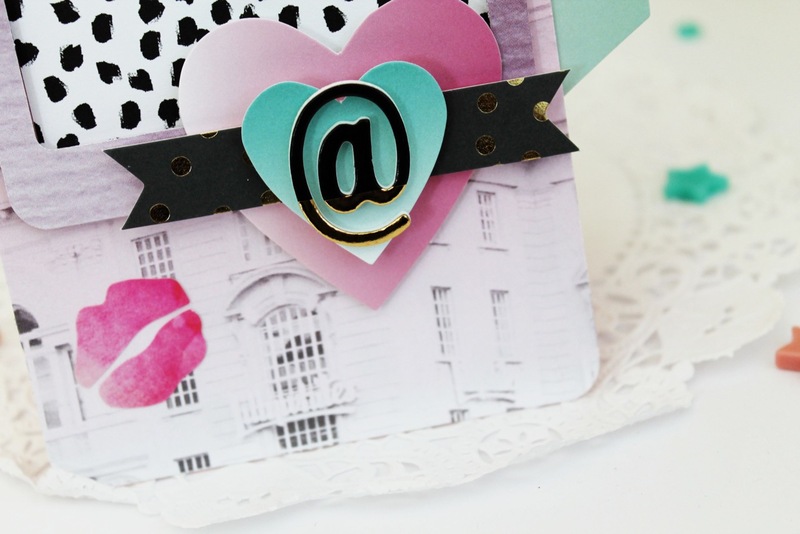 Pop Up Dies are ideal for gifts and card making. The dies are wafer thin and made from 100% steel. 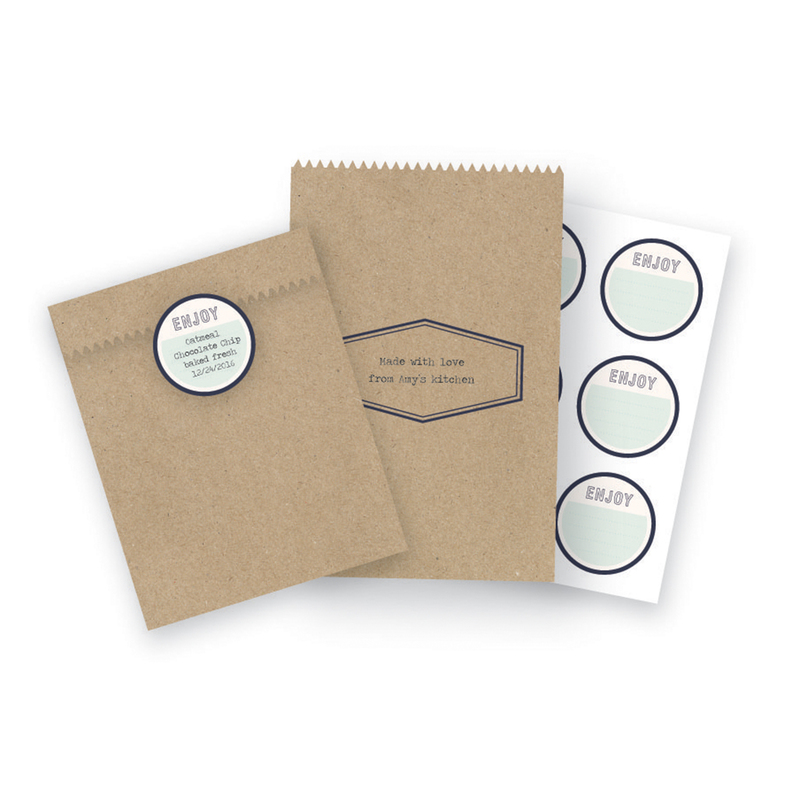 They’re packaged in clear zipper pouches with a magnetic backing. 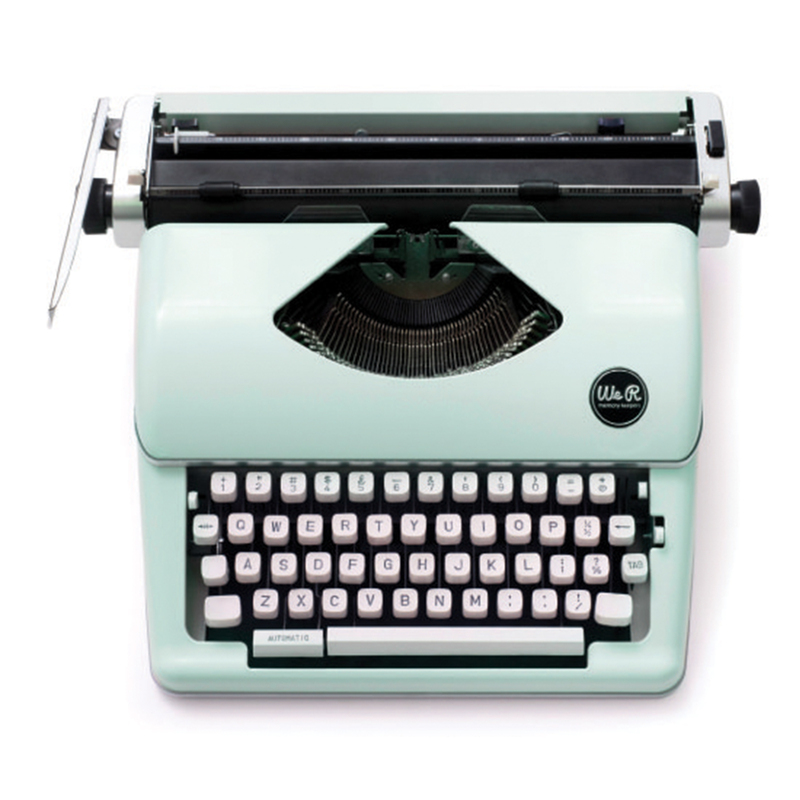 The black Typecast typewriters, two new colors of typewriters, and a new Typecast paper collection will soon be available to ship to retailers worldwide. 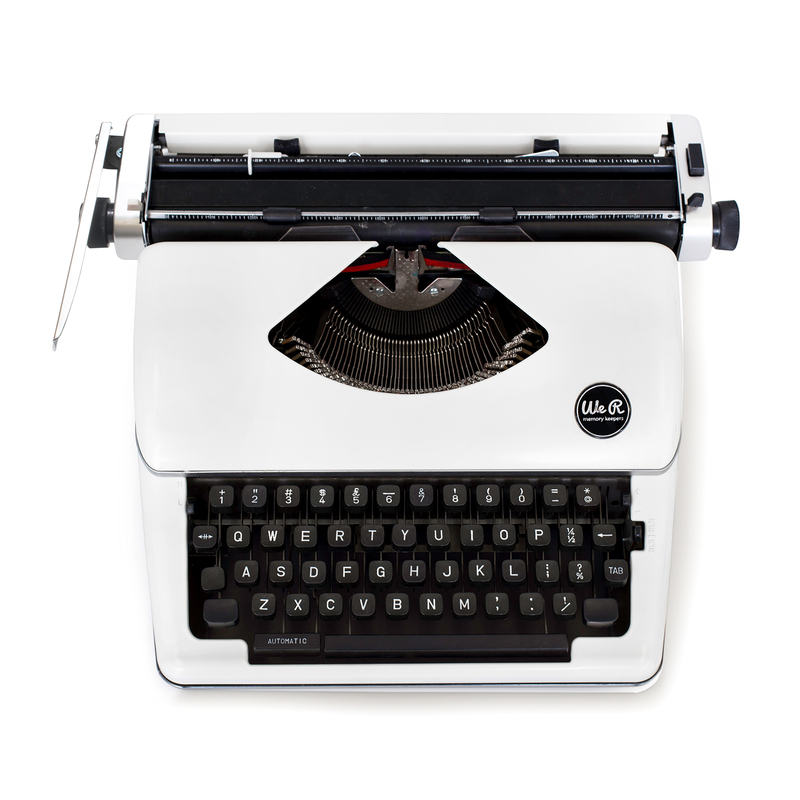 This retro typewriter allows modern makers to quickly add journaling to layouts, cards, and projects. Unique colors of ink are available as well. 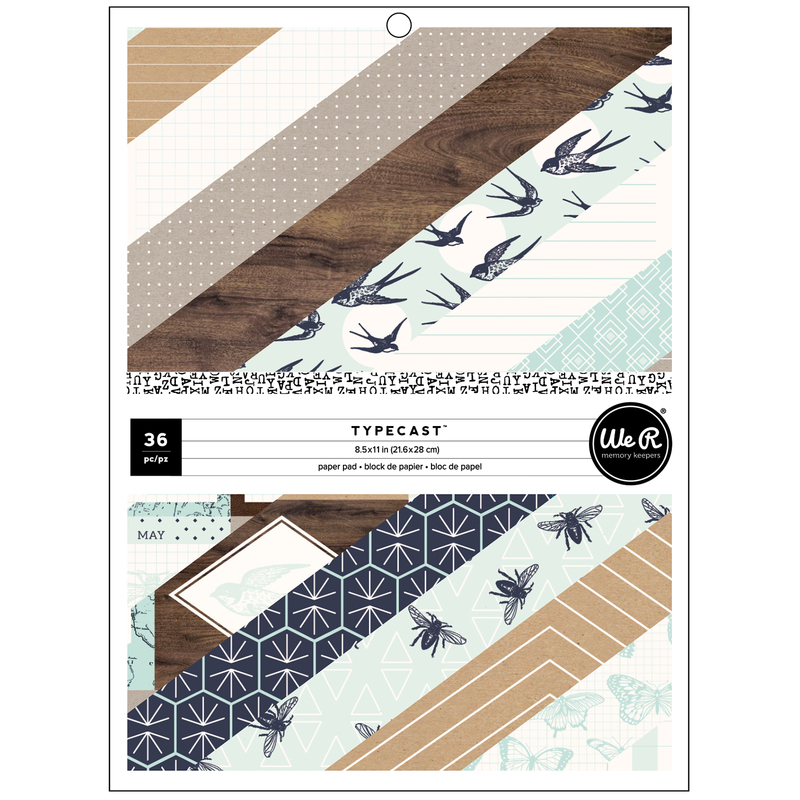 Be sure to look for other typecast paper accessories. Well friends, that’s all the new releases we have for you today. We want to know–which one are you most excited about? Share in the comments below. 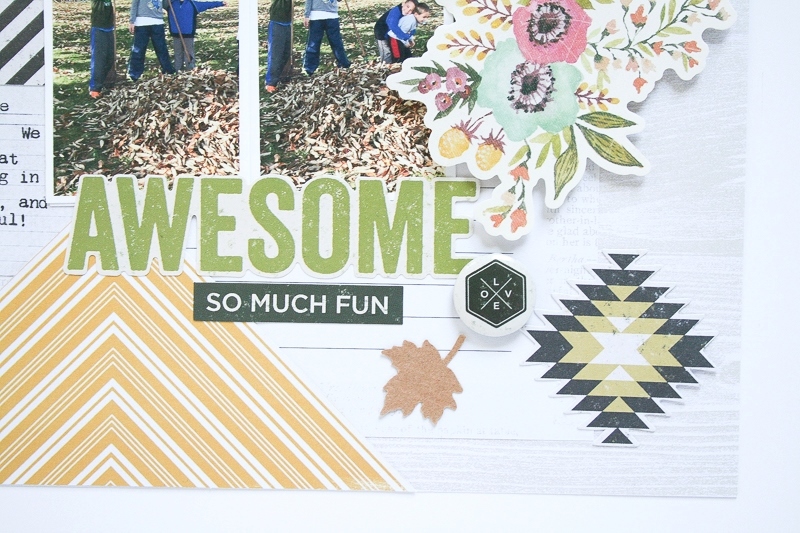 Hello everyone, Wendy here today to a layout I created about our fall experience last year. We live in FL, so we won’t be seeing fall type things until at least January so we took a little vacation to celebrate real fall last year. The new High Five collection that We R Memory Keepers just released was so perfect for our pictures and I love that I was able to mix in a few other collections so easily! I began my page with the journaling card, Oh the Places You’ll Go, and my 4×6 picture, this is my “photo block” and the beginning of most of my layouts. To keep a fall feel, I chose the light wood grain paper from the Typecast collection to use as my background, with a map paper chosen from the 8.5×11 pad. The bold colors of the High Five collection look stunning when mixed with some lighter shades and bring more notice to my photos. 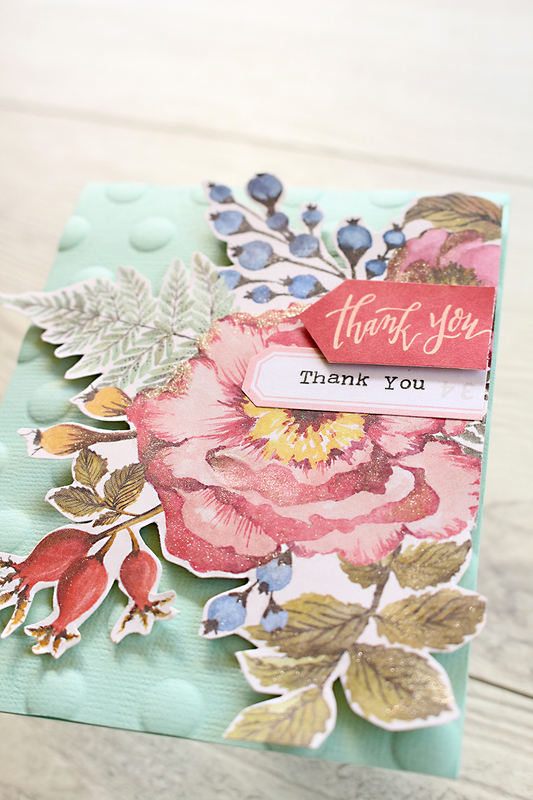 I love using the 6×6 paper pads to add in layers and splashes of color, without cutting up my 12×12 pieces. The smaller patterns are also easier to mix and match sometimes I have found. 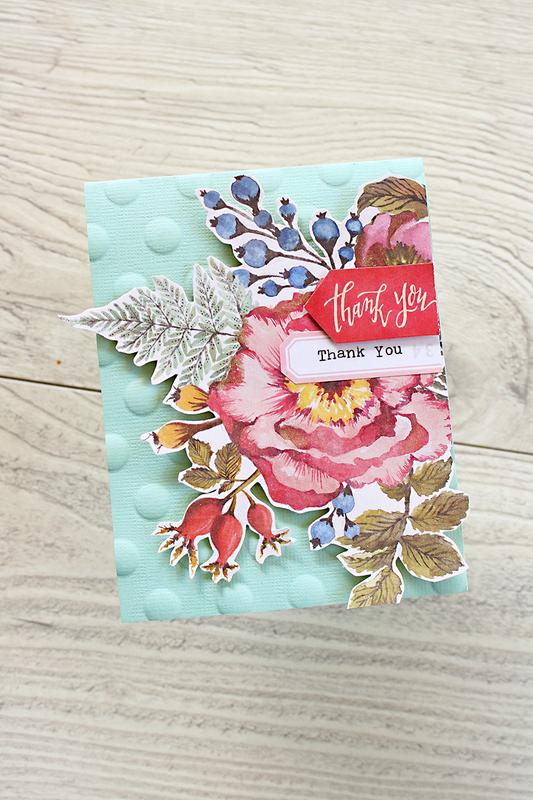 Design Tip: I love cutting 4×6 pieces and 2×3 pieces from the 6×6 paper pads and my leftovers which allow me to mix things up easily, sometimes even trying color combos and designs that I might not have tried otherwise. 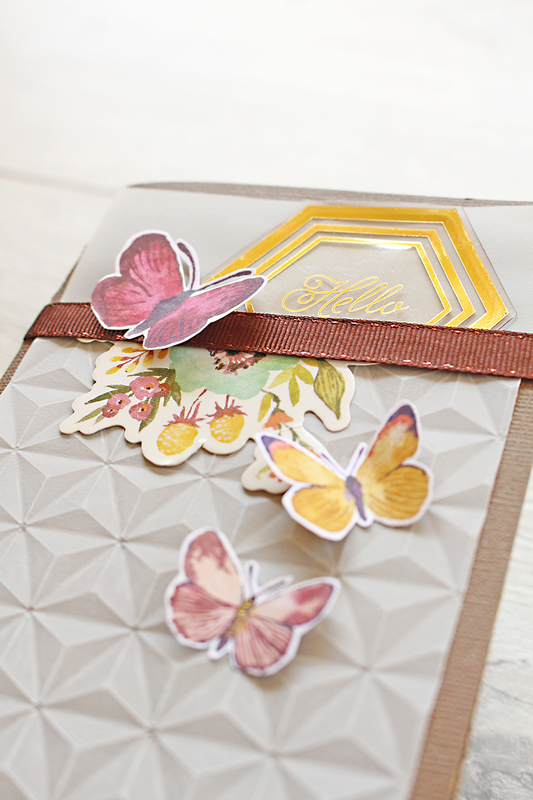 To anchor my “photo block” and to add some additional color, I chose a floral sticker from the Wildflower collection. This was a perfect place to tuck in a few small wallet sized pictures and to build my sentiment/title. Aren’t those buttons the cutest! And I love that they don’t add much bulk in to my page either. I used a yellow arrow design from the Wildflower 6×6 paper pad to lead the eyes down the page and to add some bold color. 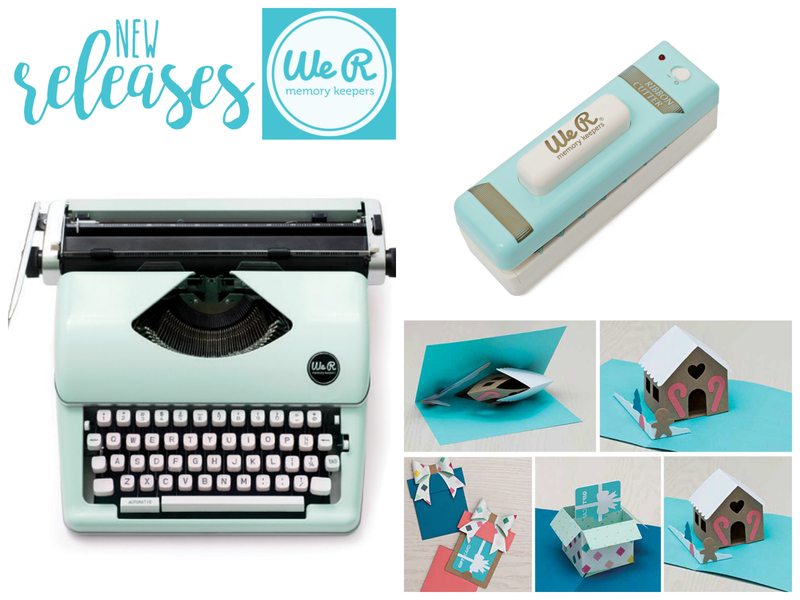 But my favorite piece has to be the typed journaling that I was able to include on my page using the new We R Memory Keepers Typewriter! 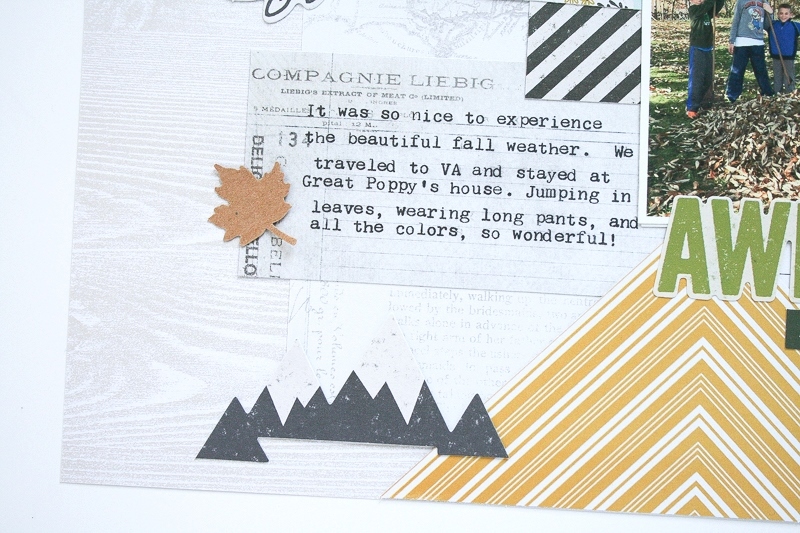 The addition of a few fall leaves cut from the Kraft 3×5 paper pad completed my fall layout made from mixing and matching the various We R Memory Keepers collections! Throughout the fall I make several large batches of this yummy stuff. 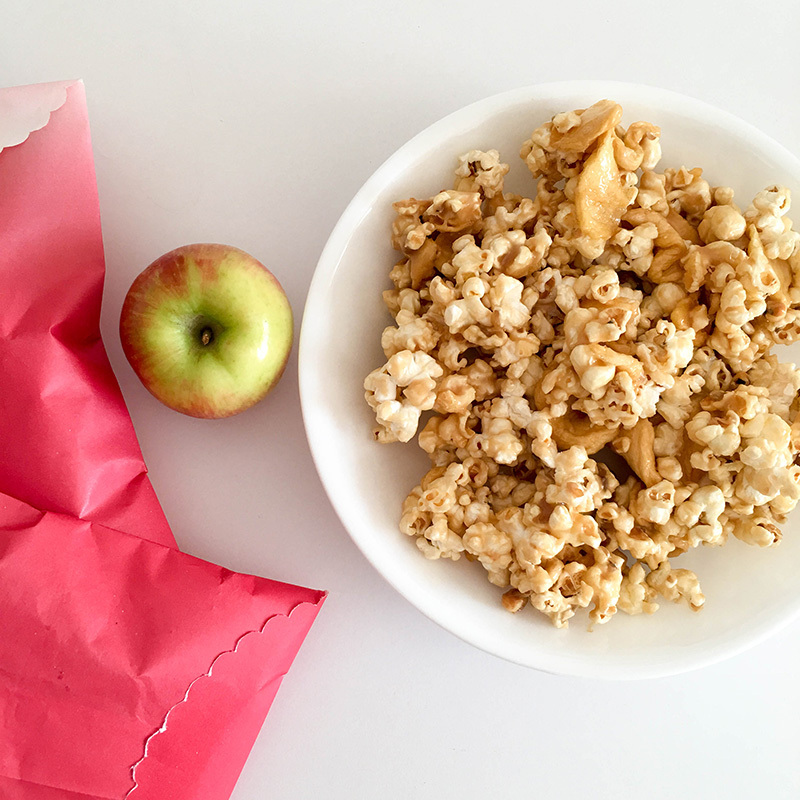 It’s a basic caramel popcorn with dried apple slices tossed in. 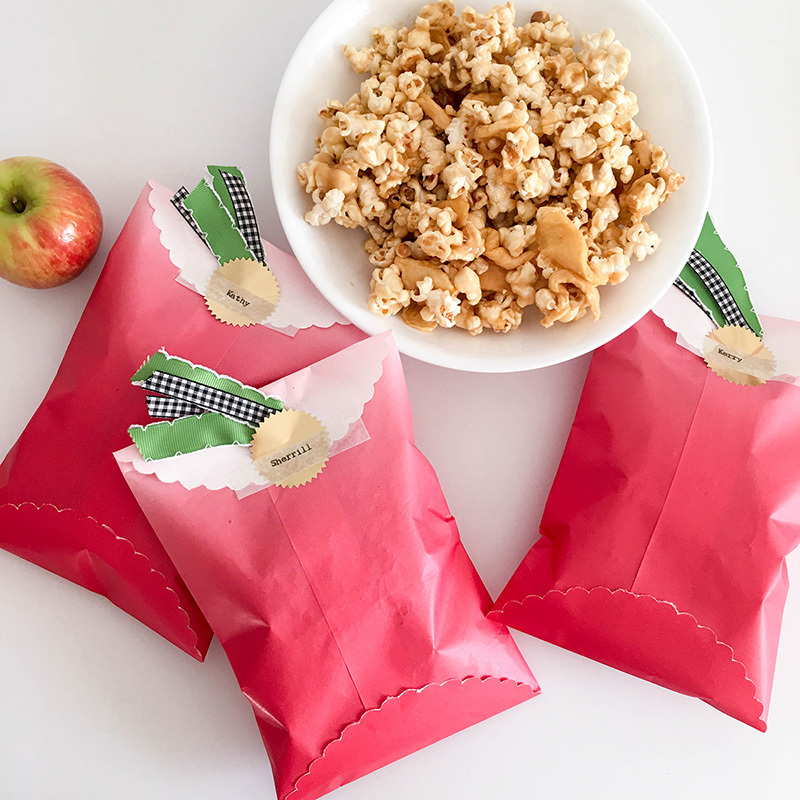 I love to share, so I pulled out a few sheets of Oh Goodie glassine paper and made some apple-themed goodie bags to fill with popcorn. 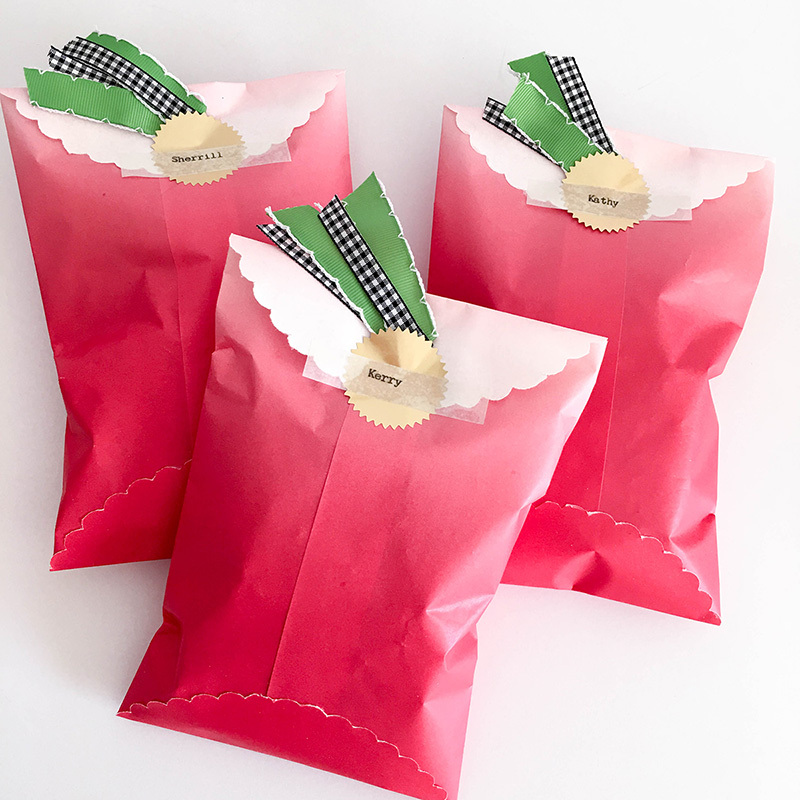 I used the scalloped Goodie Bag Guide to make my bags. I chose red paper because I used red apples in the recipe. 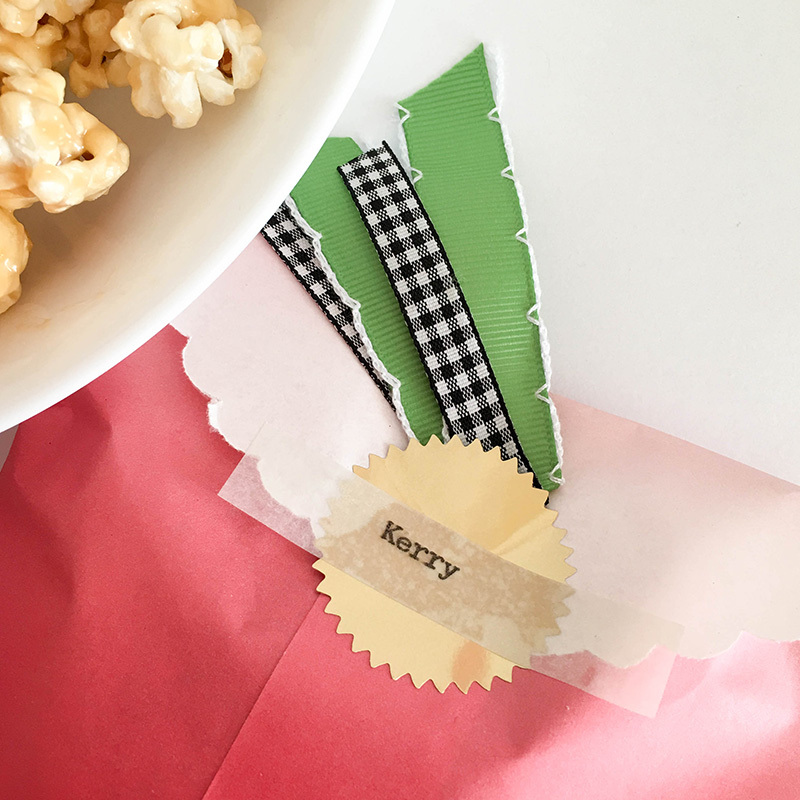 Once filled with popcorn, I stapled ribbon to the closed bags. 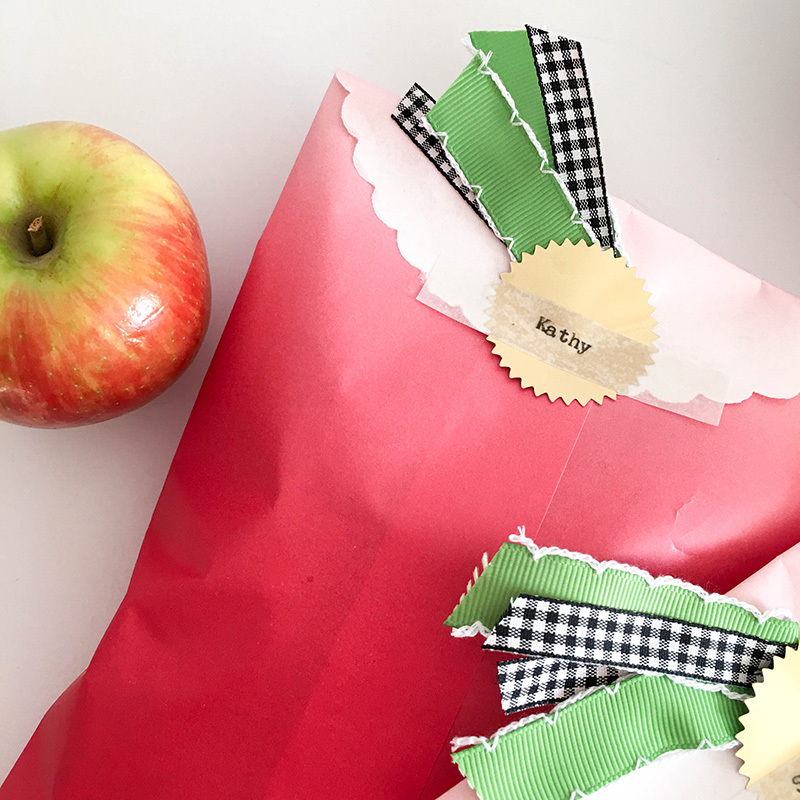 The green ribbon is like leaves and the gingham is for a fun, fall touch. I covered up the staple with an Oh Goodie gold seal. 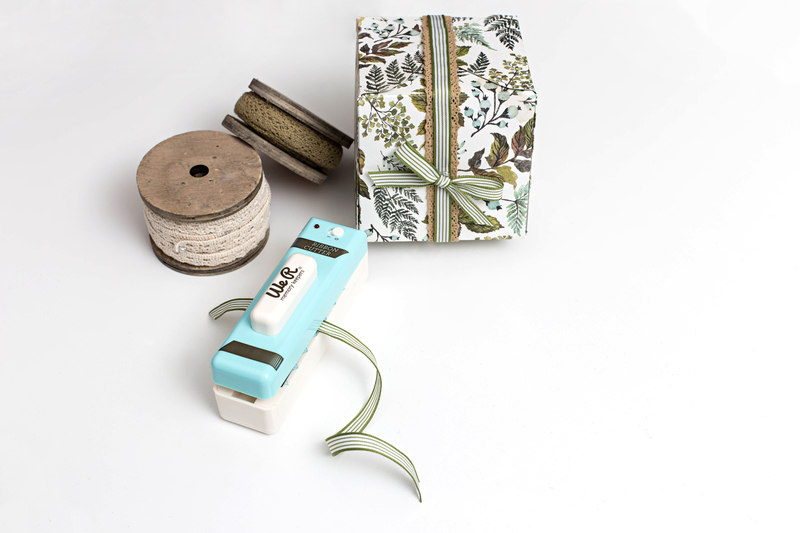 I used the Typeset typewriter to type the names of my gift recipients on Typeset washi strips. As you can see in the recipe below, this popcorn isn’t short on greasy ingredients. I love that the Oh Goodie glassine paper is so grease-resistant! You can’t see any spots, which keeps the bags pretty for gift-giving. Preheat oven to 250 degrees (or skip baking the popcorn and enjoy ooey-gooey). Pop your kernels into a large bowl and pick out any unpopped kernels. In a medium saucepan over medium heat, combine butter, brown sugar, corn syrup and salt. When mixture is melted and it begins to boil, add the sweetened condensed milk and continue stirring for five minutes (to prevent burning). Remove from heat and pour over popcorn and apples. Stir to evenly coat. Remove from oven, break into pieces, and allow to cool. 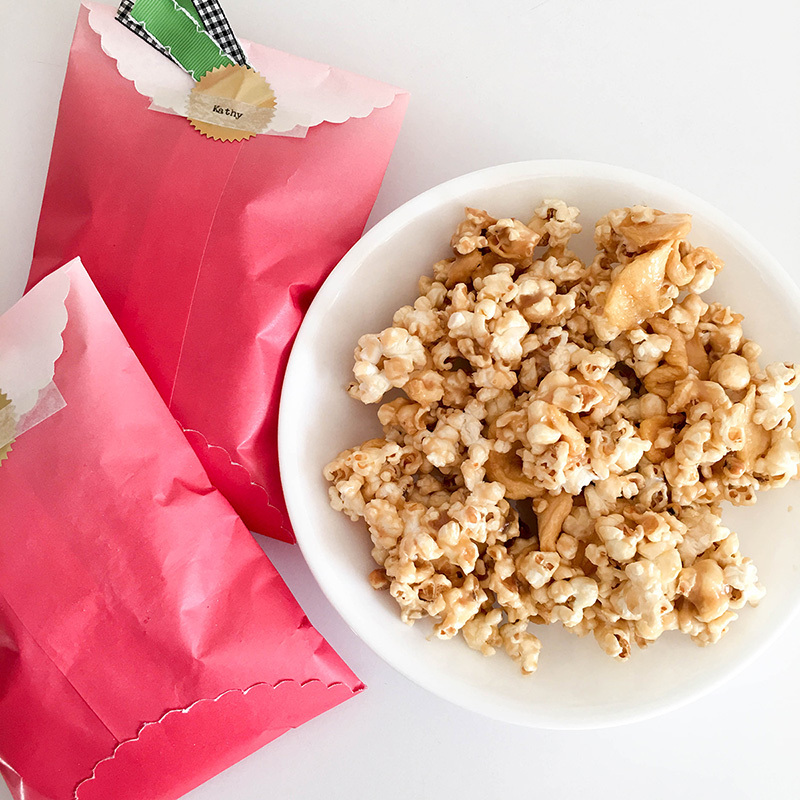 I’d love to know what you think if you give this recipe a try, and I’d love to see your Goodie Bags, too! Enjoy creating! Hello! Laura here today with a festive fall pumpkin wreath project. It is still pretty warm where I live in Arizona but the temperatures are starting to cool off at night. I recently pulled out all my fall decorations. One of my favorite things to decorate with is wreaths. They provide a cheery welcome to everyone that comes to your home. 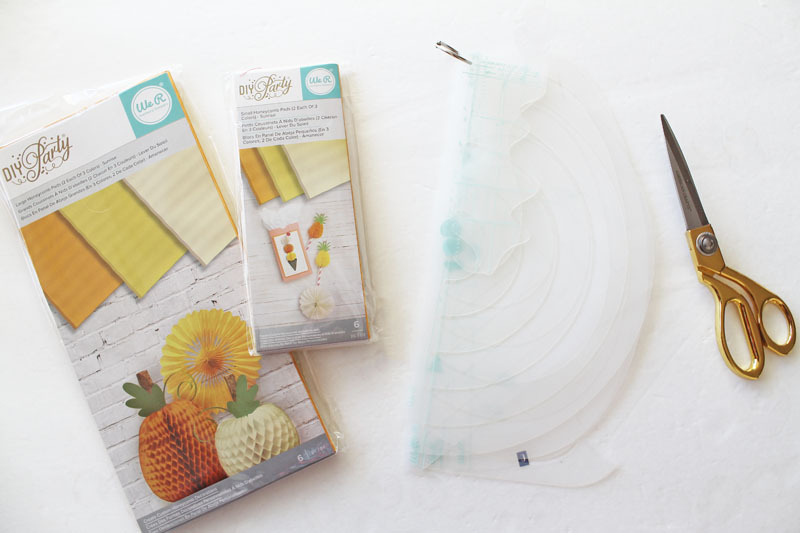 To get started making this wreath you will need the DIY Party Sunrise Honeycomb Pads and DIY Party Honeycomb Stencils. I used the small honeycomb pad, but you could also easily make a larger version of this wreath by using the Large Sunrise Honeycomb Pads. On each honeycomb pad you will trace the smallest of the pumpkin stencil shapes, for a total of three pumpkin shapes on each pad – orange, yellow and cream. 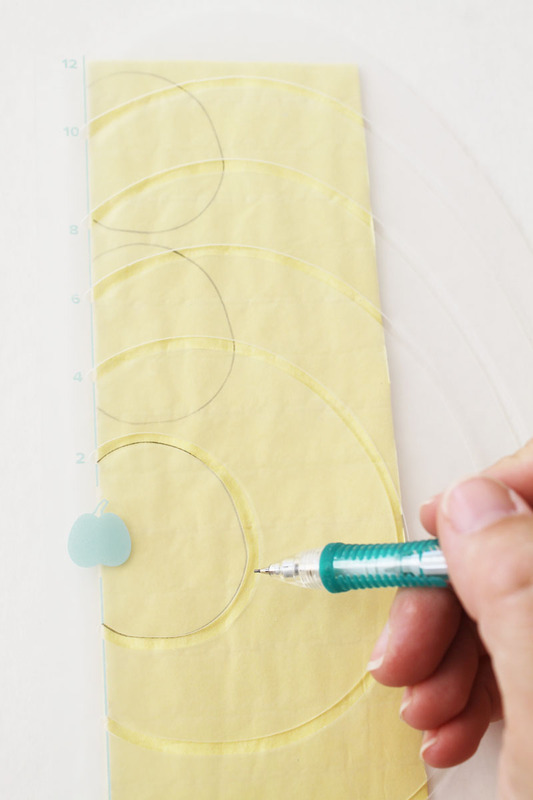 Be sure to trace your shape on the adhered edge. 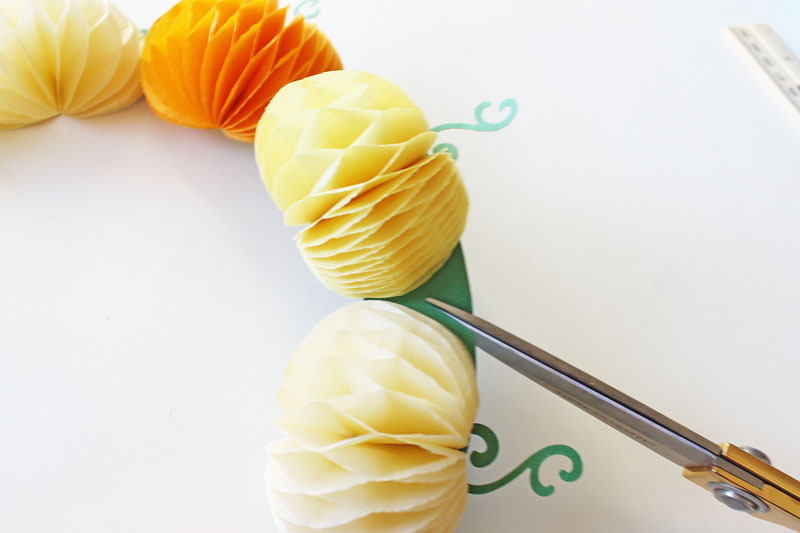 Cut out each of the shapes for a total of nine pumpkins. Next, you will create your paper wreath form. I used green cardstock and the circle template from the honeycomb stencils. I used the largest circle shape possible to create the wreath form. 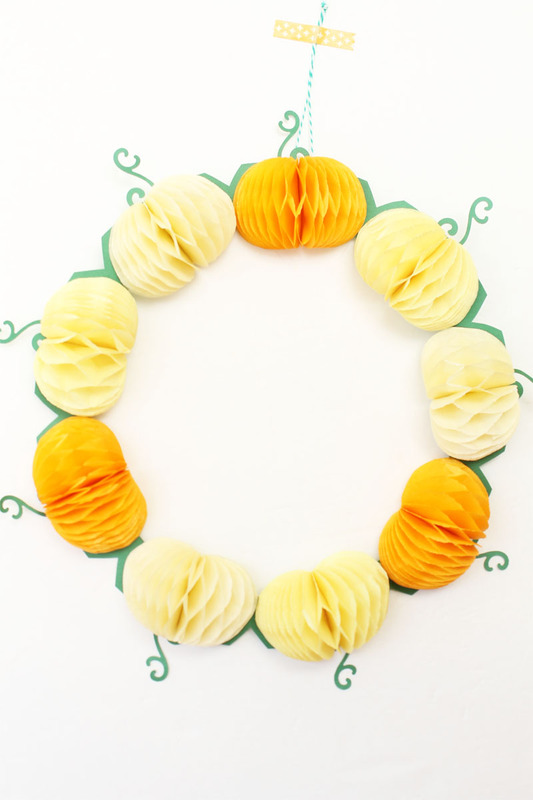 Cut out around the outer circle and the inner circle to create your wreath. I wanted some sort of stem or vine shape at the top of the pumpkin. The new Decorative Font Punch was perfect for this. 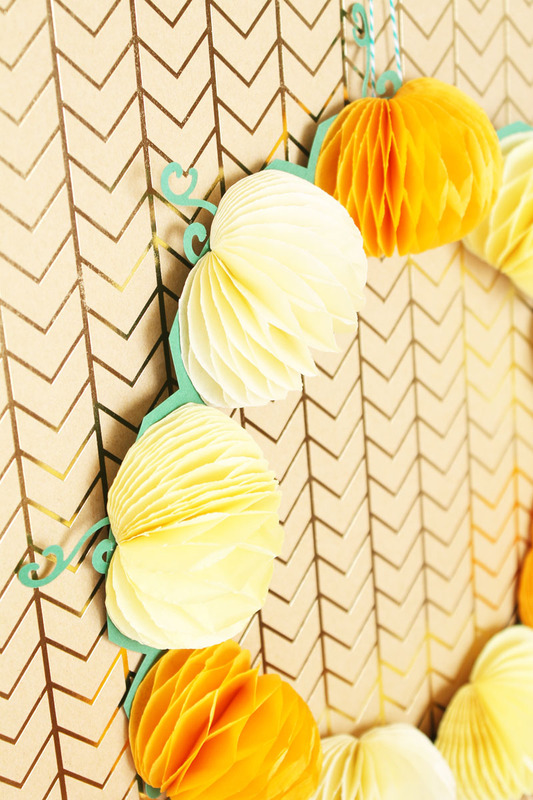 I used the leftover paper from creating the wreath form to punch out nine vines. 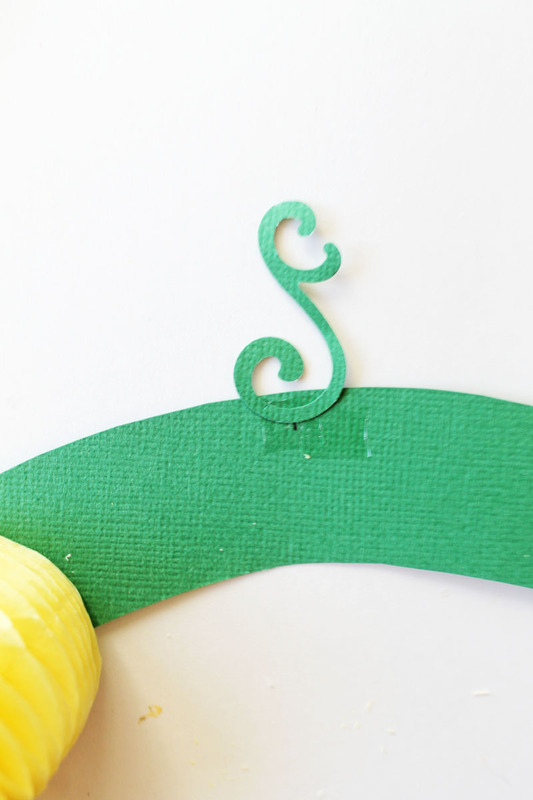 Using my sticky thumb adhesive I attached the green vine to the top edge of the wreath form. 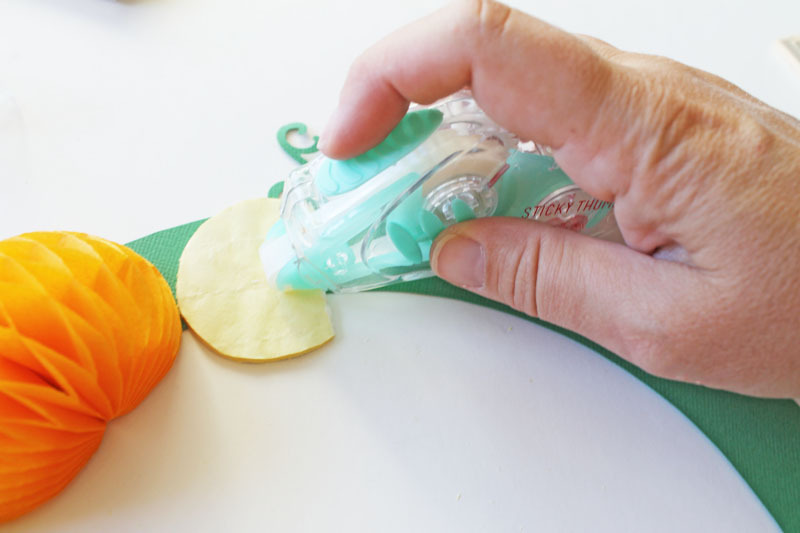 Then, I added each pumpkin shape by using adhesive on either side of the pumpkin shape and pressing it down firmly on the green ring. I repeated this process around the entire wreath, alternating the colors of the pumpkins. I snipped the excess green paper from in between each pumpkin shape. Lastly, I attached a green and white twine loop using a piece of clear tape on the back to create a hanger for my wreath. To dress up the wreath for Halloween, you could add some little cut out shapes to create jack-o-lantern faces on some or all of the pumpkins. 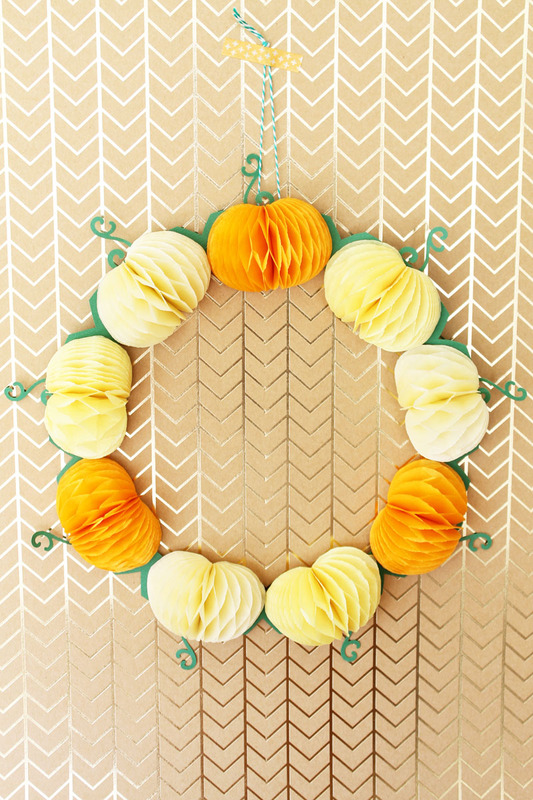 For now though, I love this little pumpkin wreath just as it is. Good Monday morning friends! 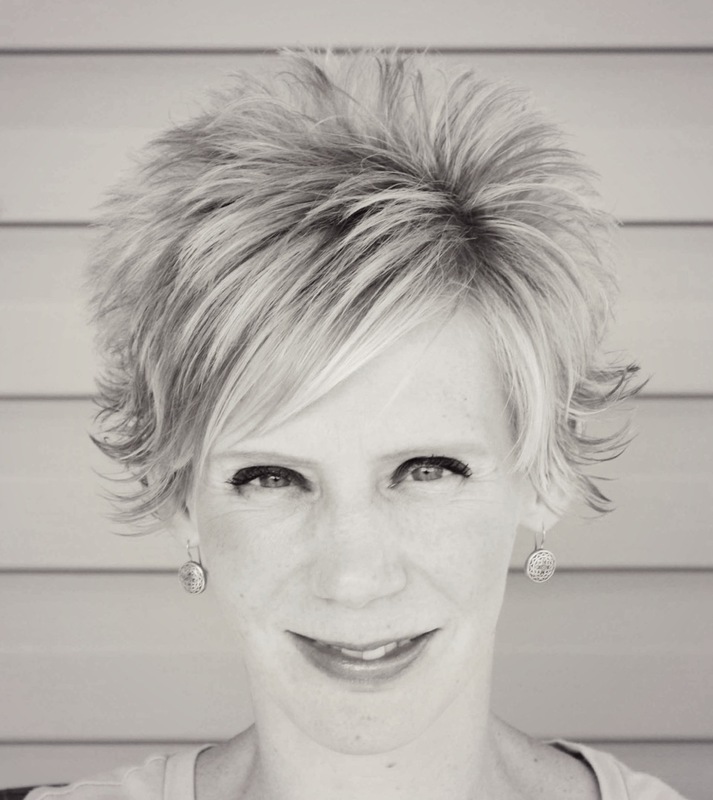 It’s Aly Dosdall here again, and I don’t know about you, but I am so excited that fall officially begins this week! 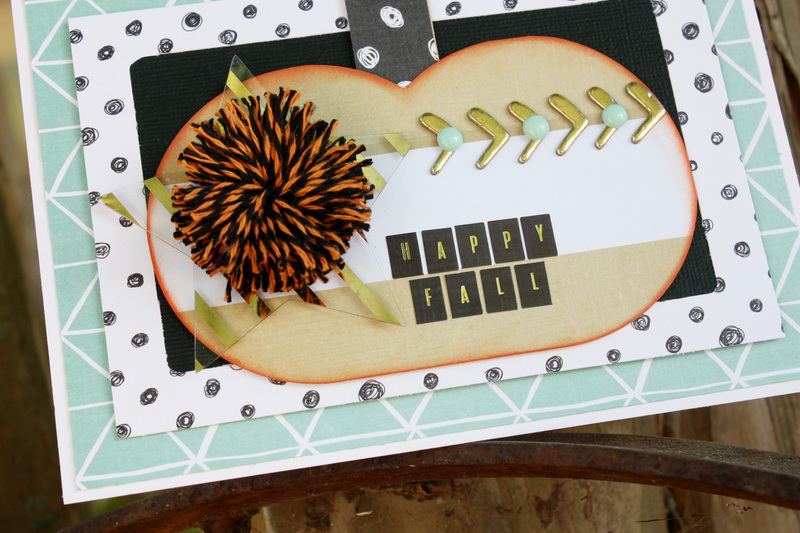 In fact we’re all so excited here at We R that we’ll be featuring fall projects from our design team all week long. 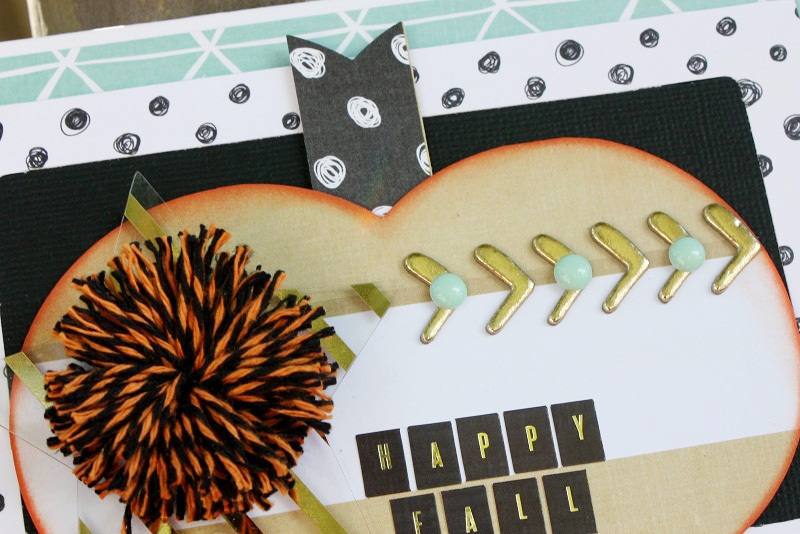 So if you’re in the mood for some fall crafting inspiration, you’re in luck! 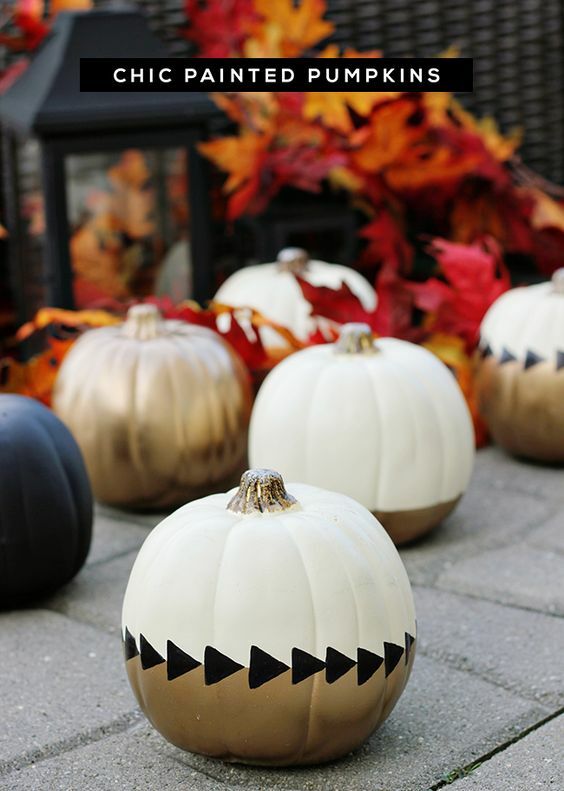 I’m getting things started this week with an easy fall decor idea. 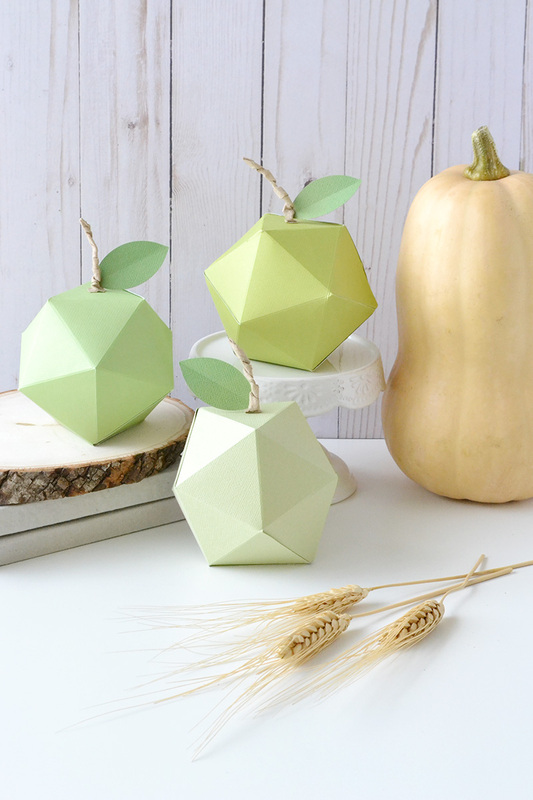 Recently I was browsing Pinterest and came across a lovely fall vignette featuring white pumpkins and green apples. 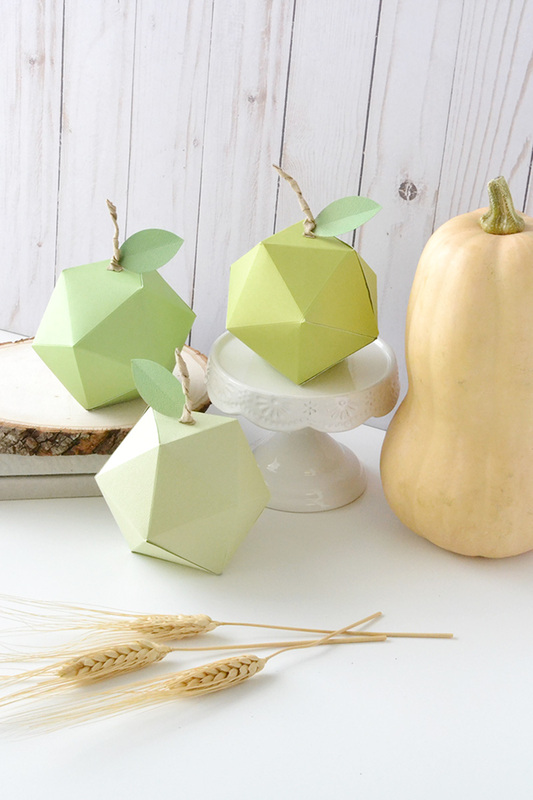 I just loved the pairing, but wanted to come up with a different twist on the idea, so I decided to make geometric paper apples using the Trim and Score Board together with the Triangle Score Guide for my fall decor. 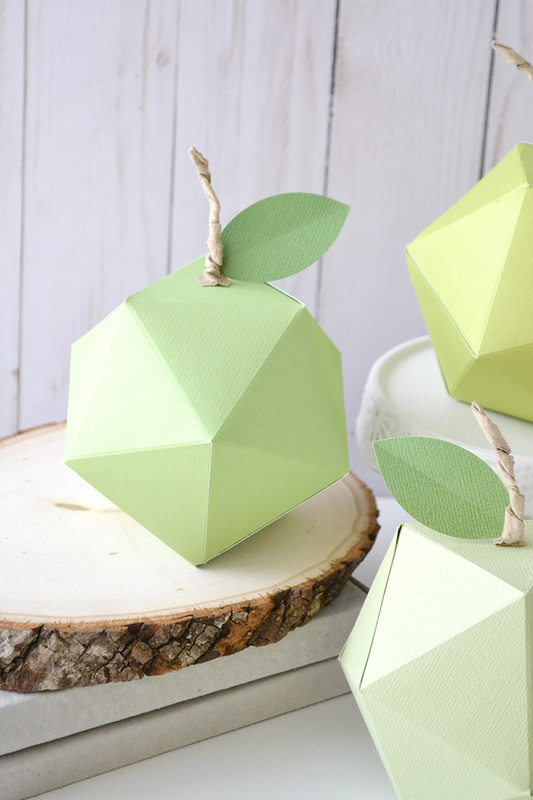 To make my geometric apples I started with three 12×12 sheets of apple green cardstock. 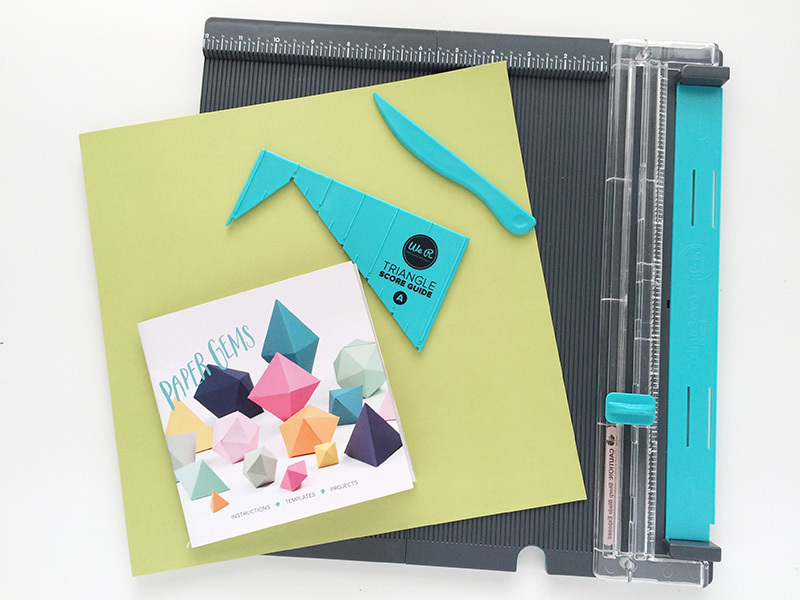 The Triangle Score Guide comes with a detailed instruction booklet. 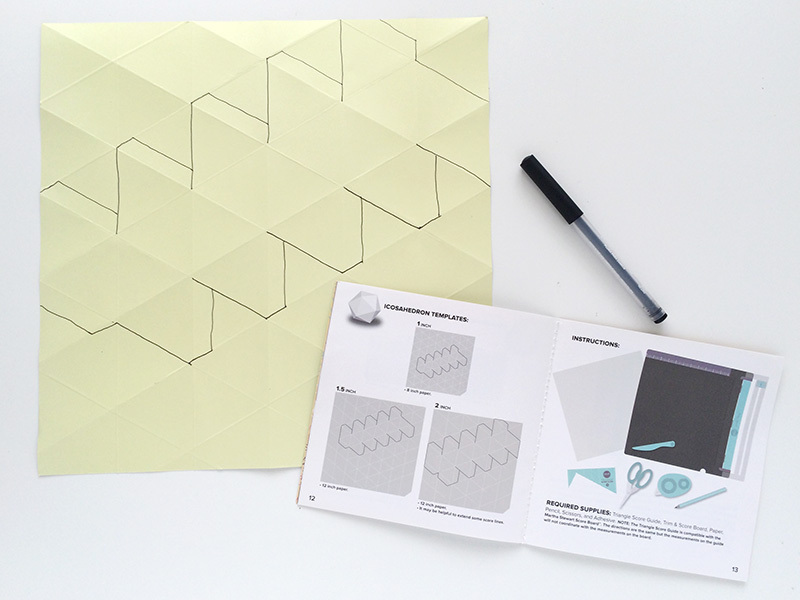 It’s important to read it all the way through before making your shapes. That helps a lot. As stated in the instructions for 2 inch icosahedrons, I placed my 12×12 paper in the Trim and Score Board and scored every 2 inches. Then I folded over the bottom left corner of my paper. That helps to make sure the paper is placed correctly as you follow the instructions. Then I removed the paper and placed the Triangle Score Guide on the Trim and Score Board flush against the top with the left edge lined up at 9 inches, and the right edge lined up at 3 inches as seen below. 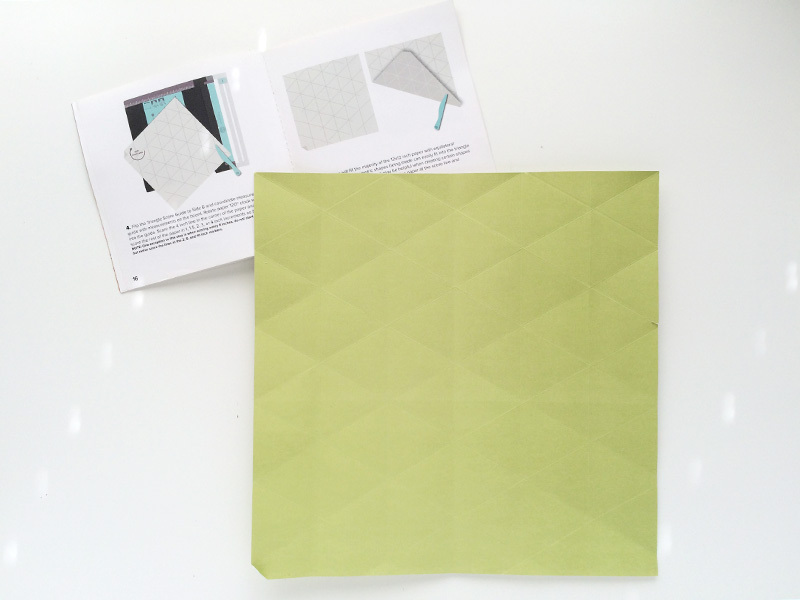 Then I placed my paper into the Triangle Score Guide with the folded corner at the bottom of the board. I made my first score line at 8 inches, and then scored every two inches on both side of the 8 inch mark. I removed my paper and flipped the Triangle Score Guide over so the back was facing upward, lining up the edges as before at 9 and 3 inches. I placed my paper on the board lining it up with the Triangle Score Guide so that the folded corner was on the left side of the board. I scored my first line at the 4 inch mark, and then I scored every 2 inches on either side of the 4 inch mark again. Then I removed the paper from the board and folded all the score lines to extend them all out to the edge of the paper. Then I flipped the paper upside down, and with my pen I drew the design in the instruction booklet for 2 inch icosahedrons on my paper so I knew where to cut. Then I cut out the design with my scissors, added Sticky Thumb Red Double Sided Tape to all the tabs, and assembled my 3D shapes. 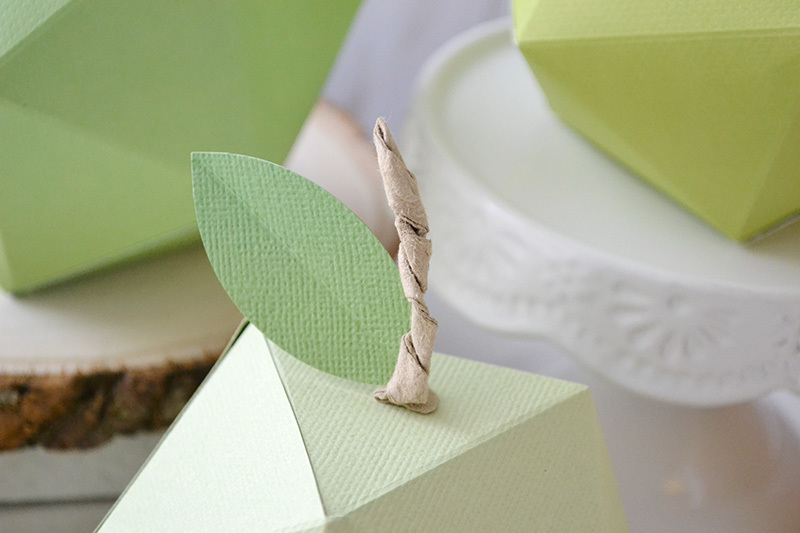 To finish off my green apples I added papers stems and leaves.